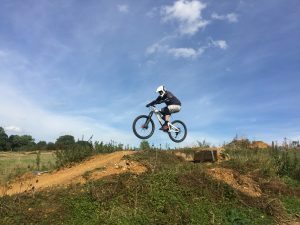 Ben wanted to return a year after his first session to develop his jumping further. 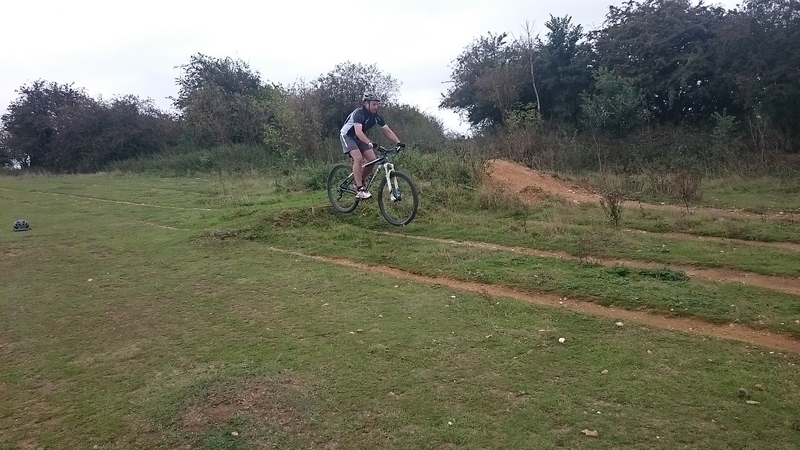 Even though he was happy with his cornering it soon became apparent that I had to correct errors there too. 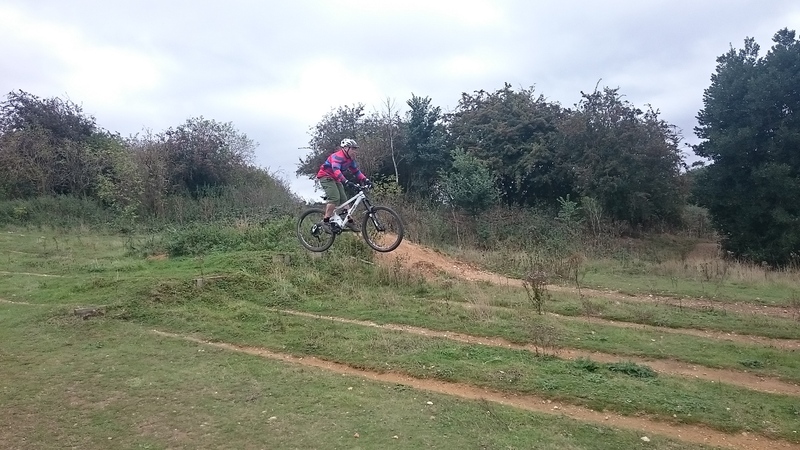 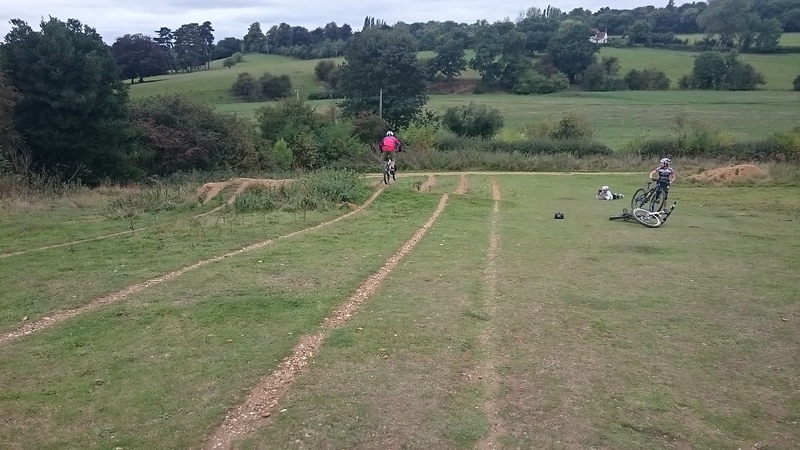 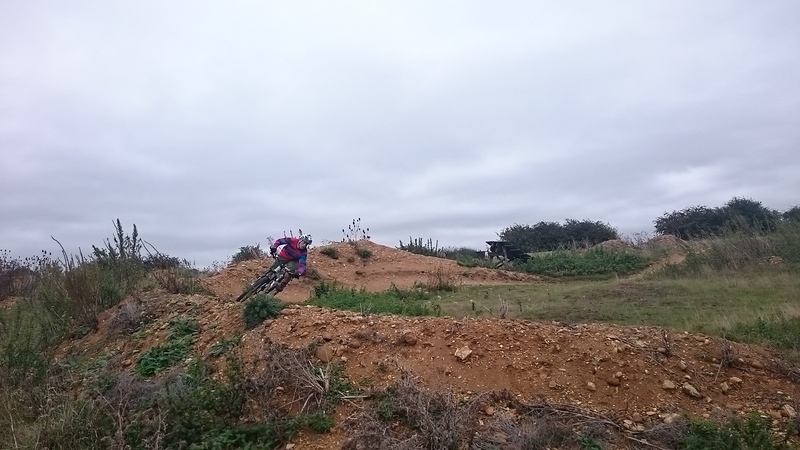 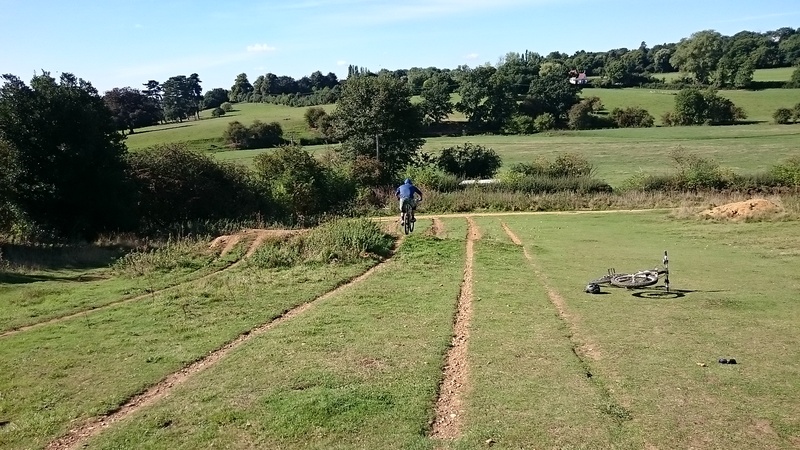 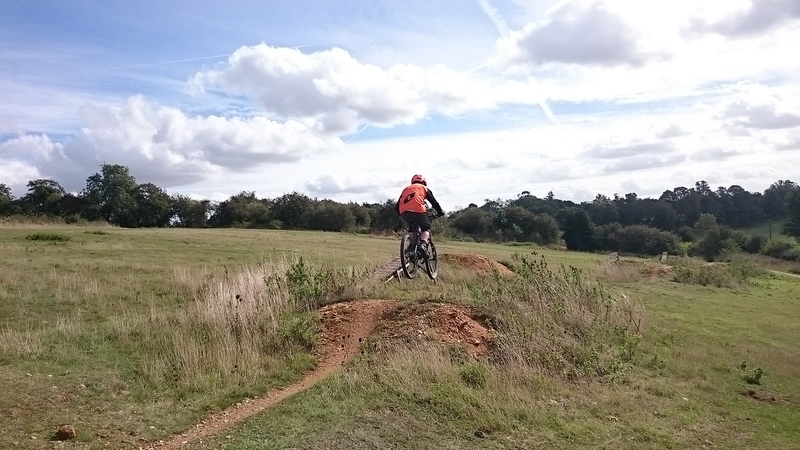 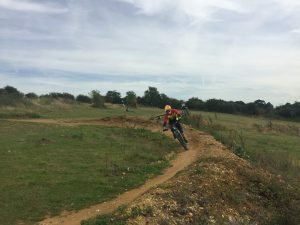 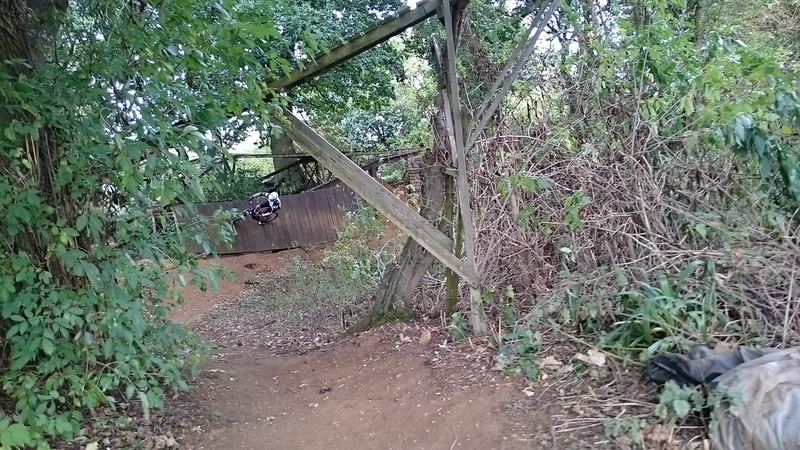 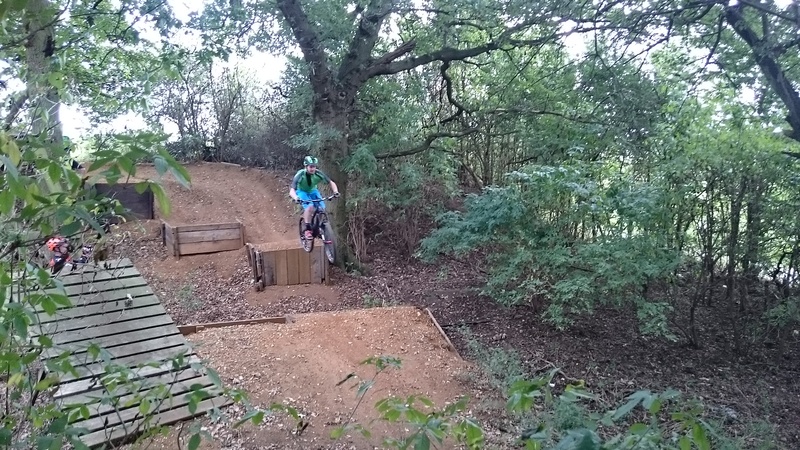 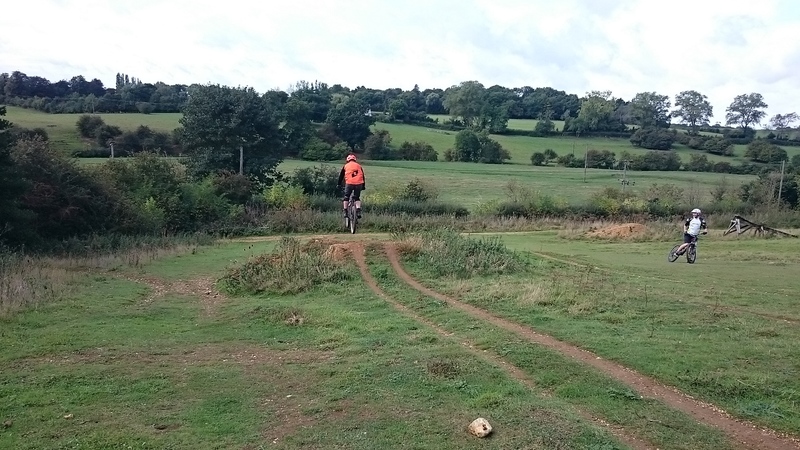 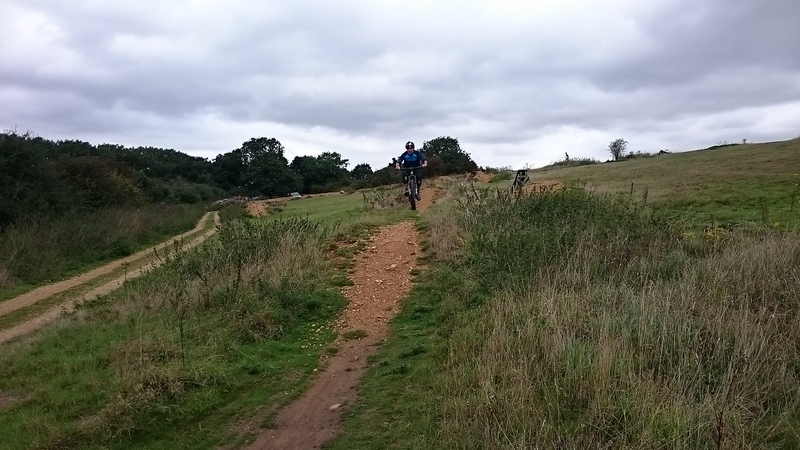 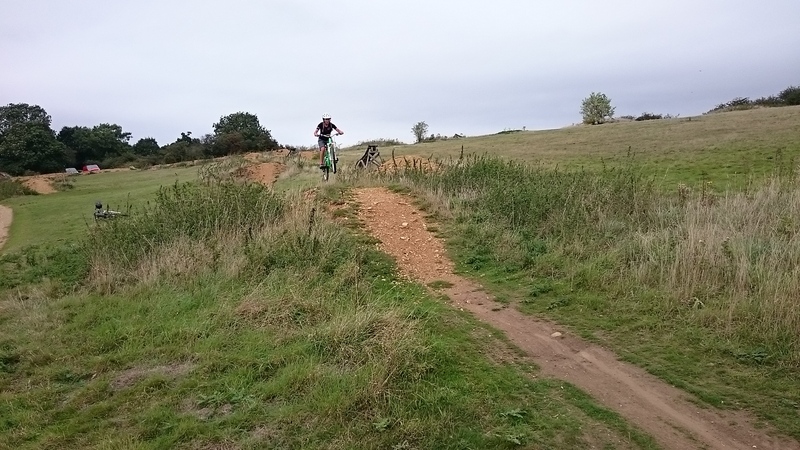 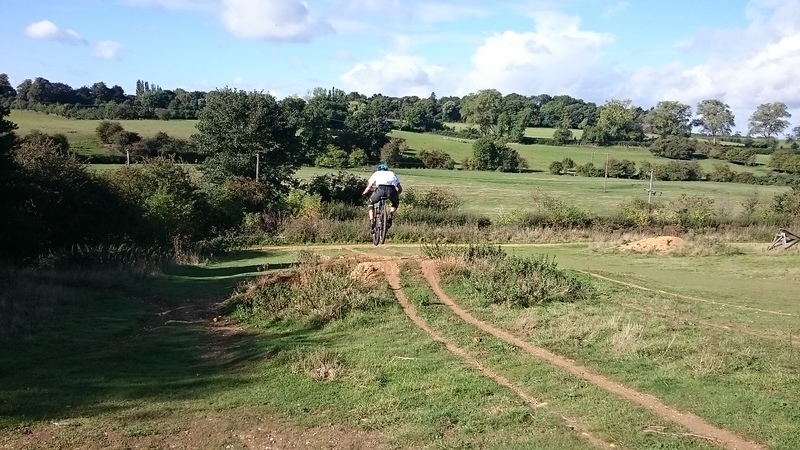 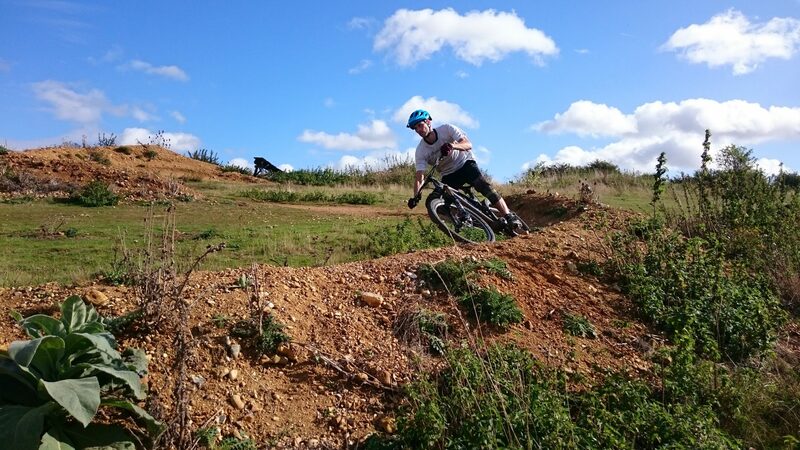 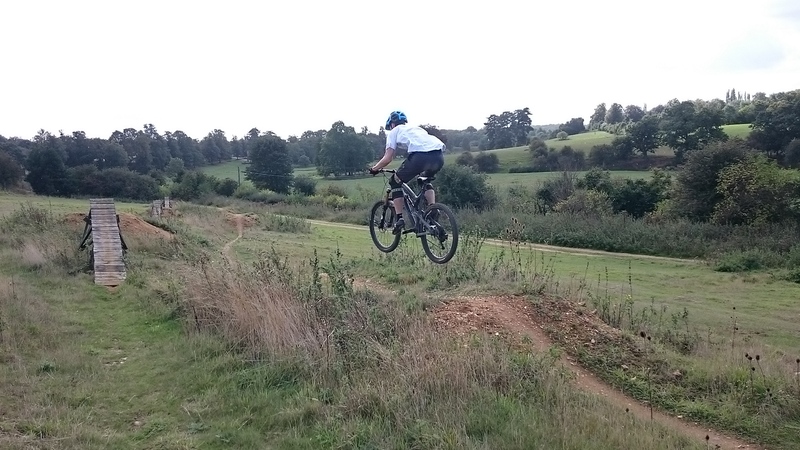 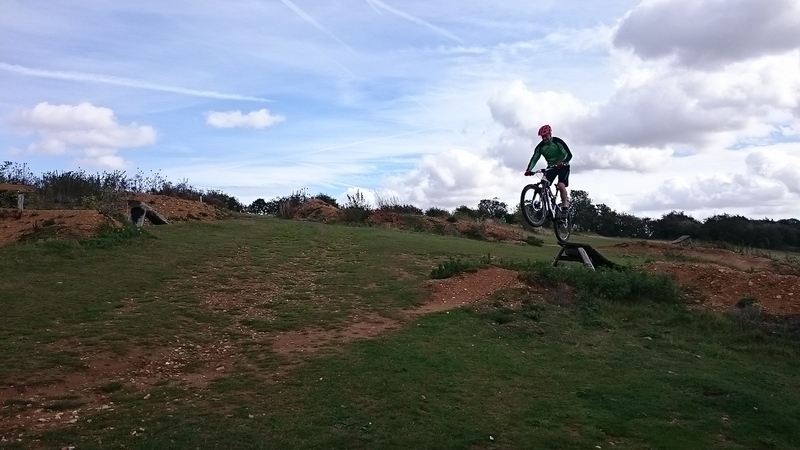 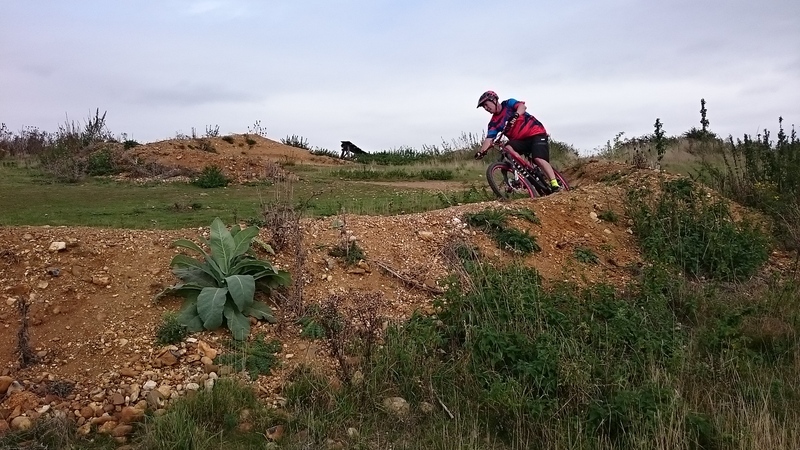 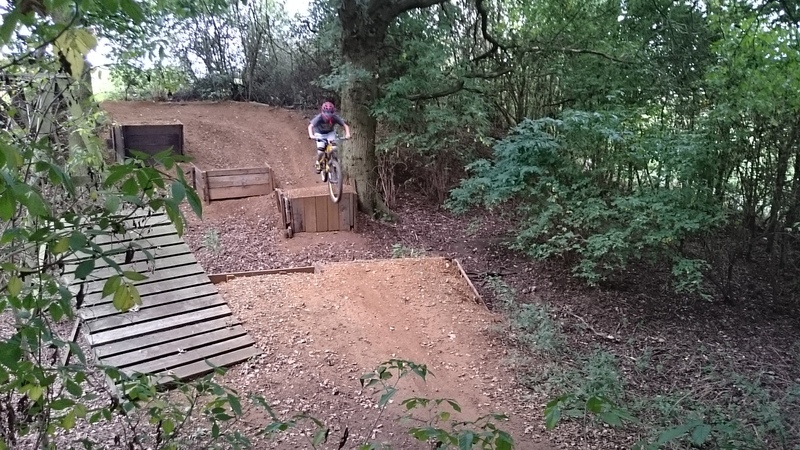 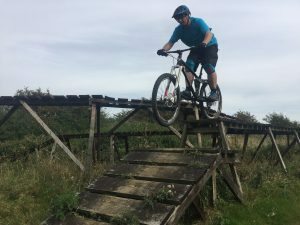 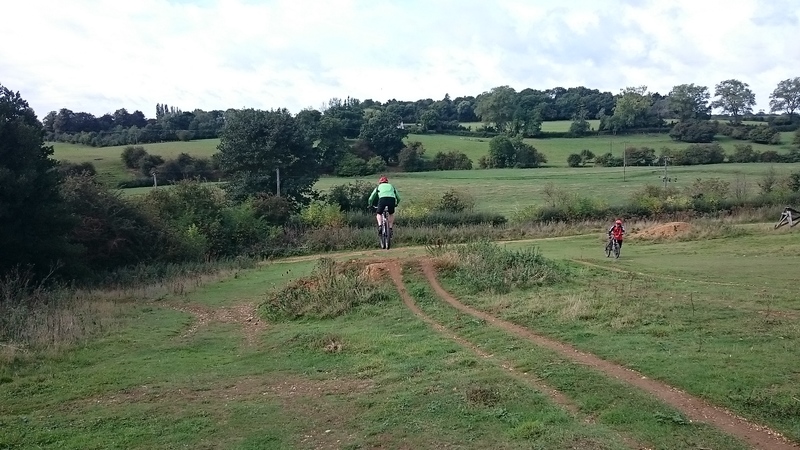 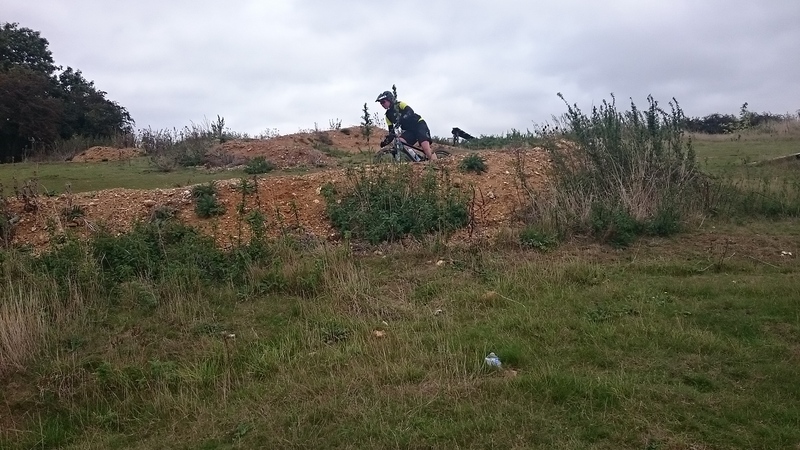 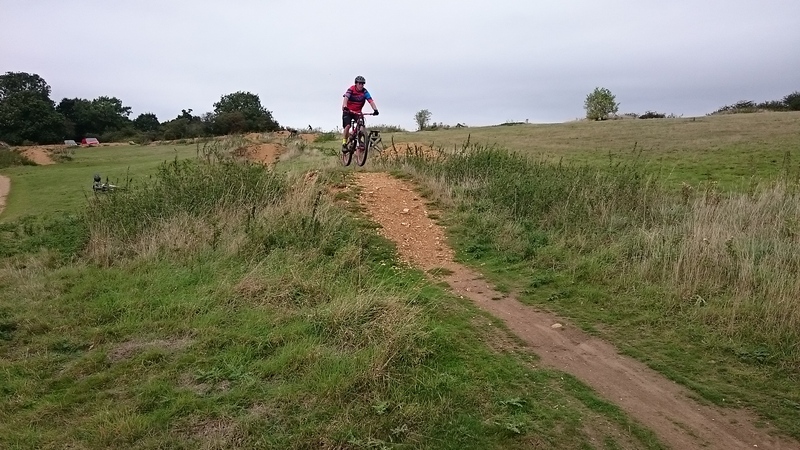 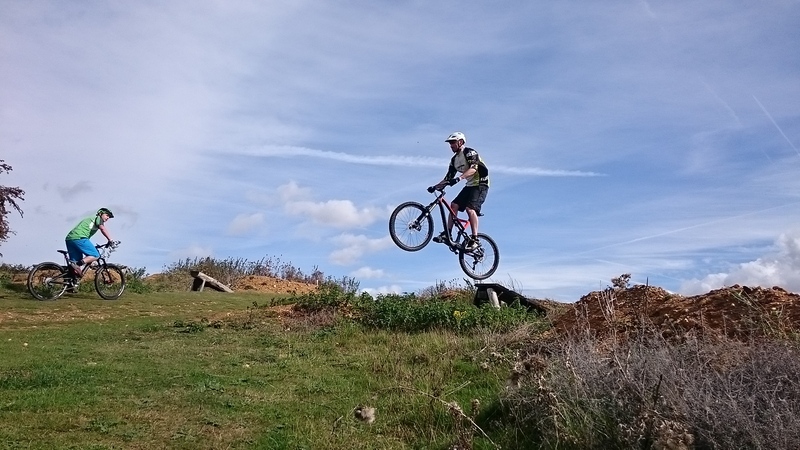 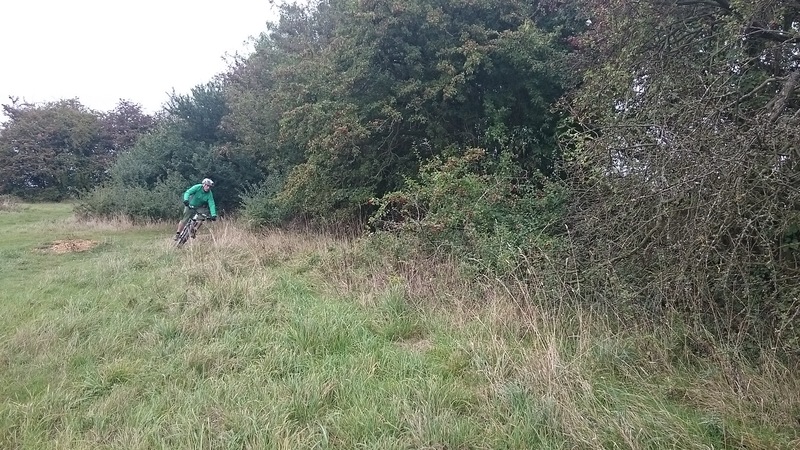 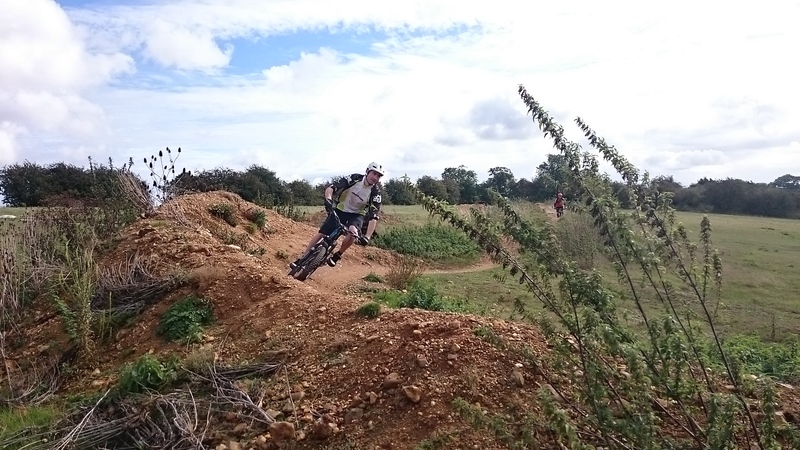 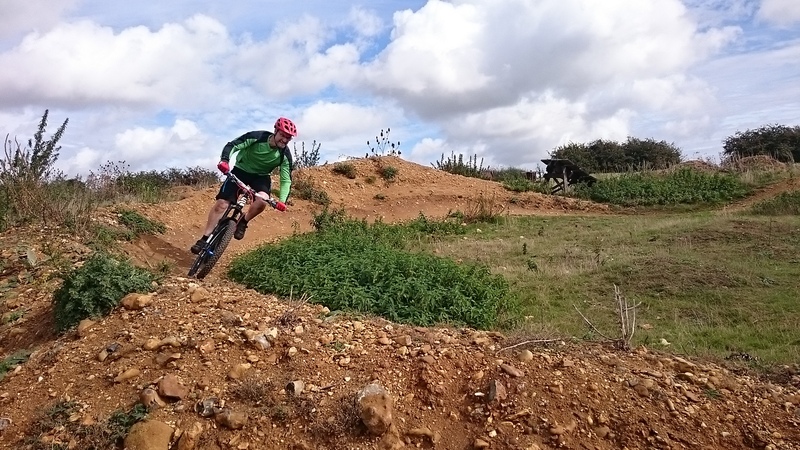 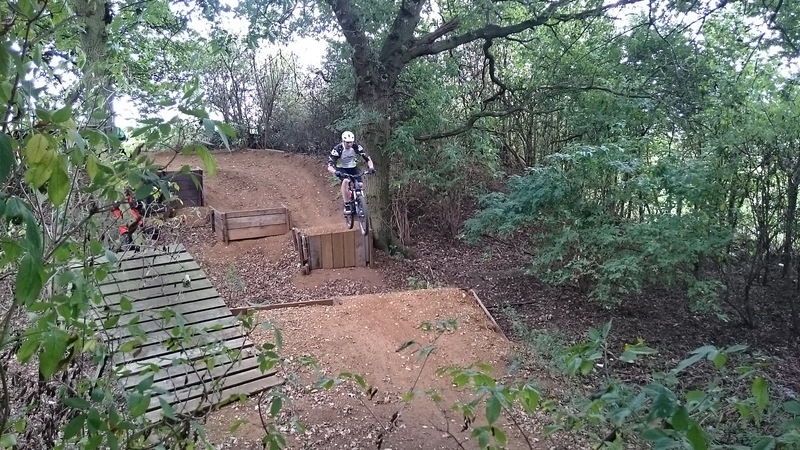 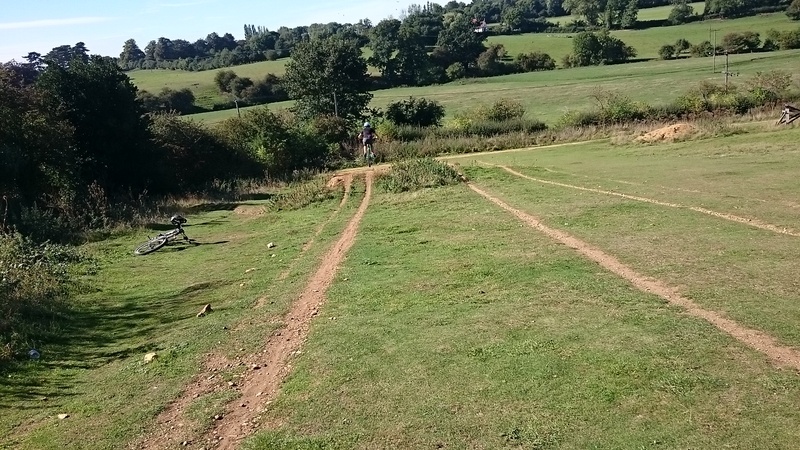 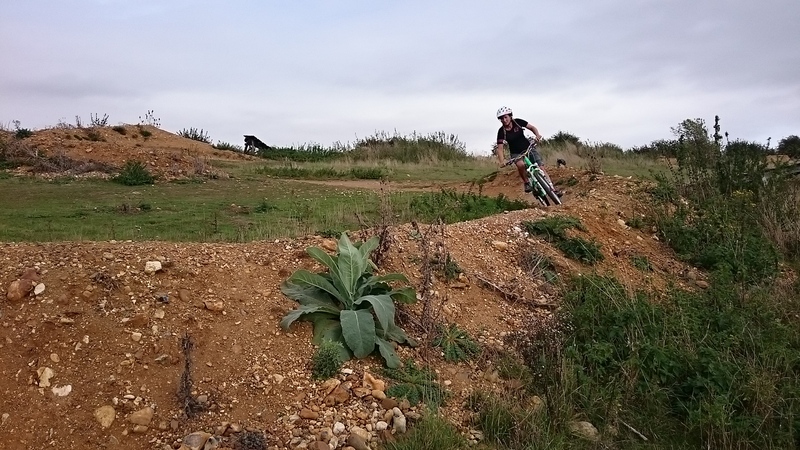 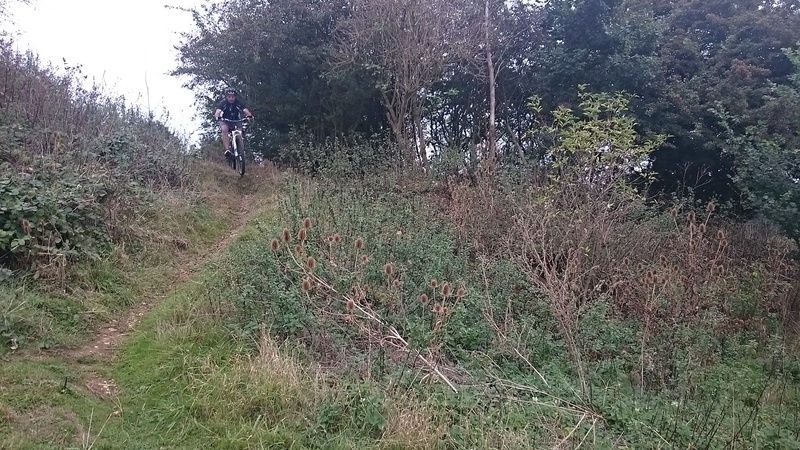 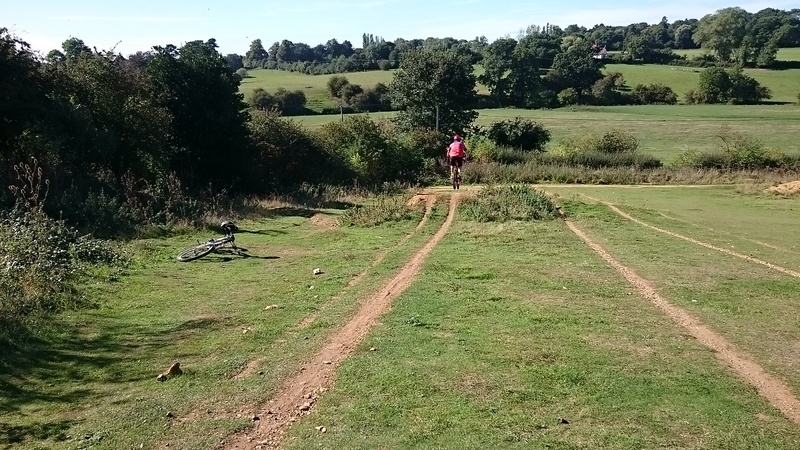 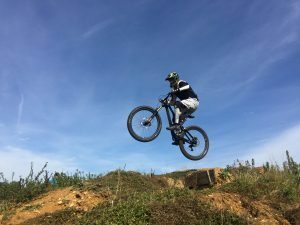 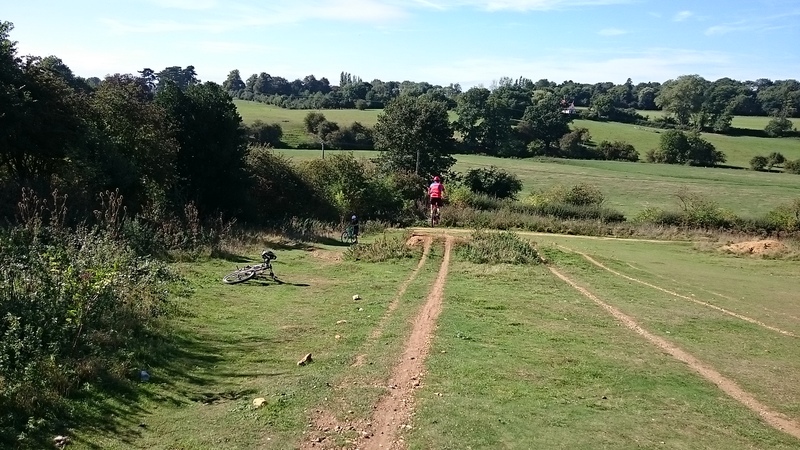 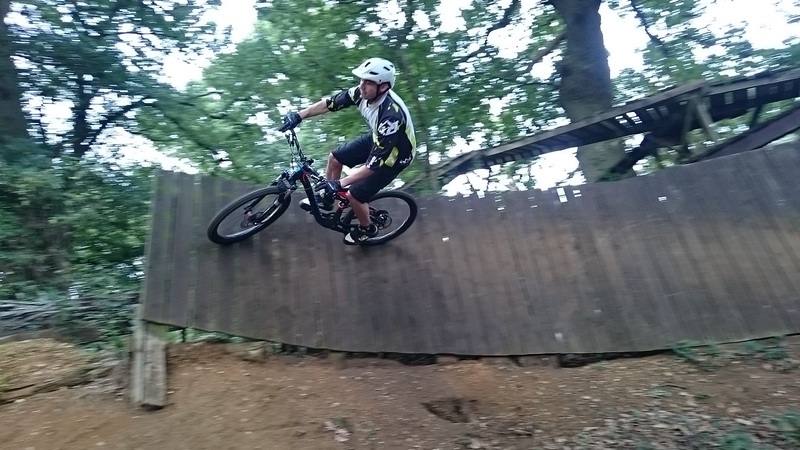 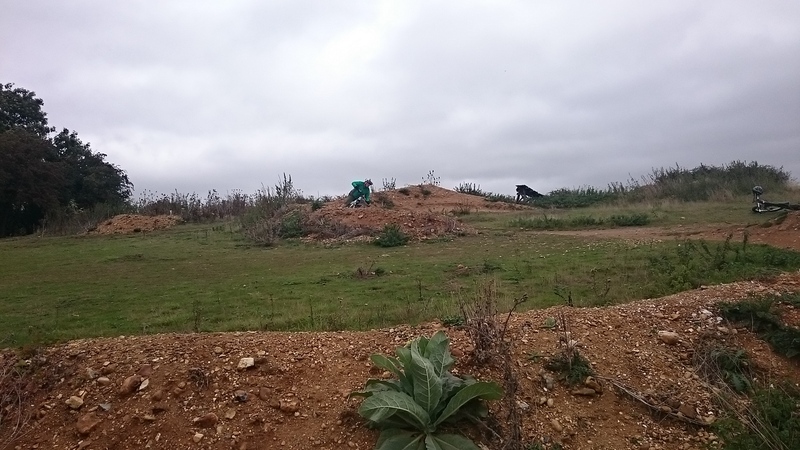 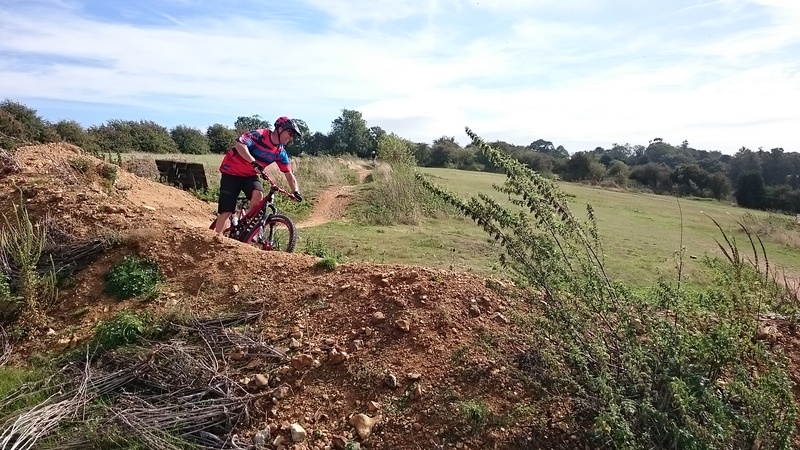 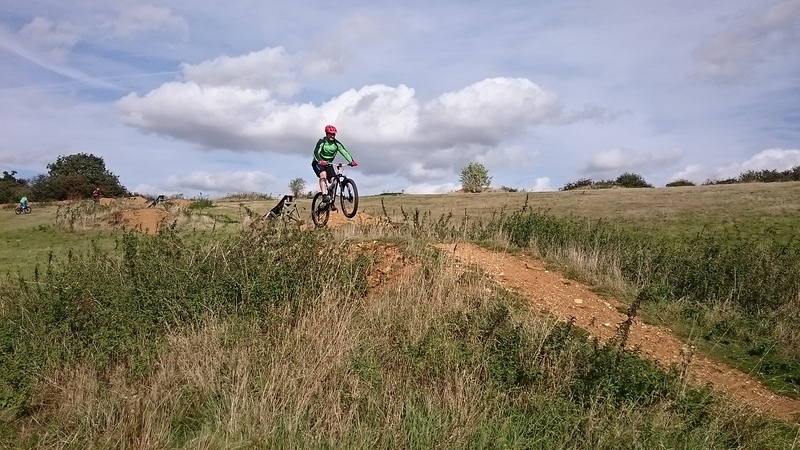 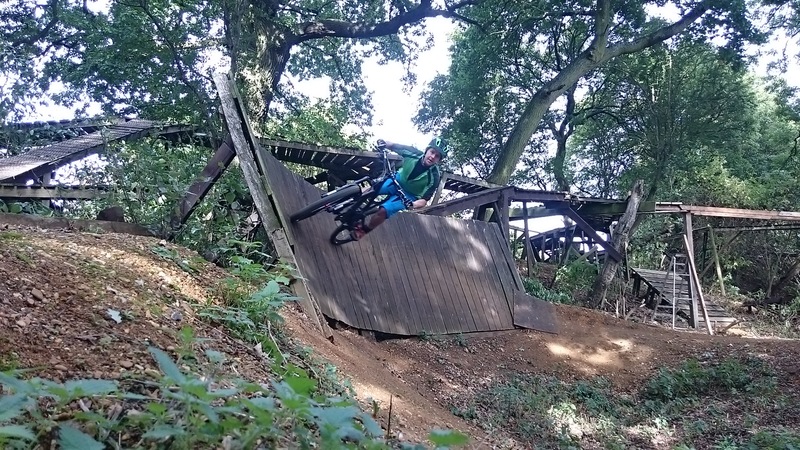 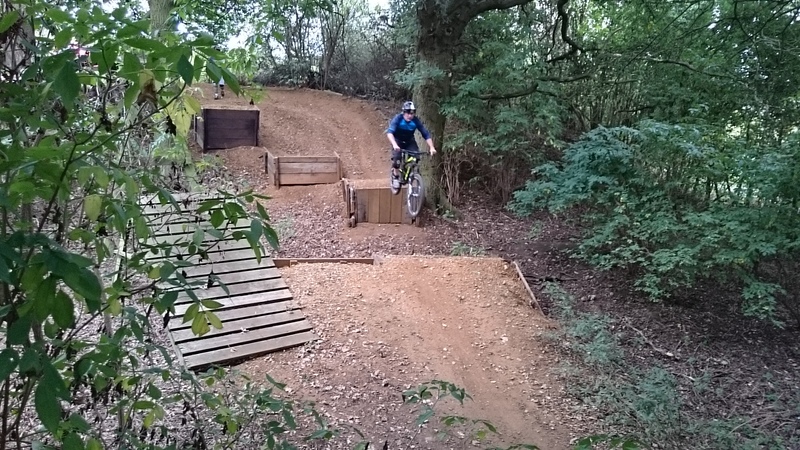 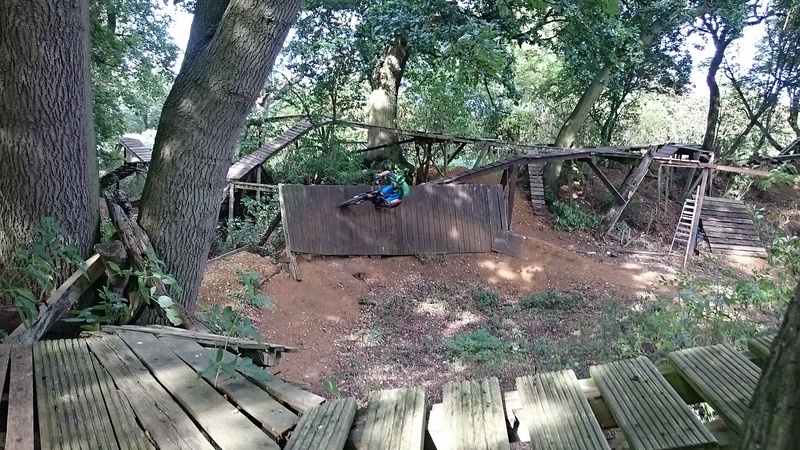 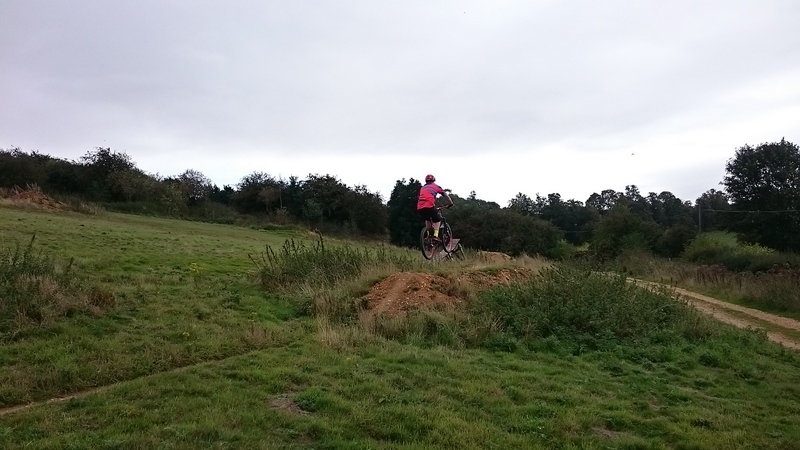 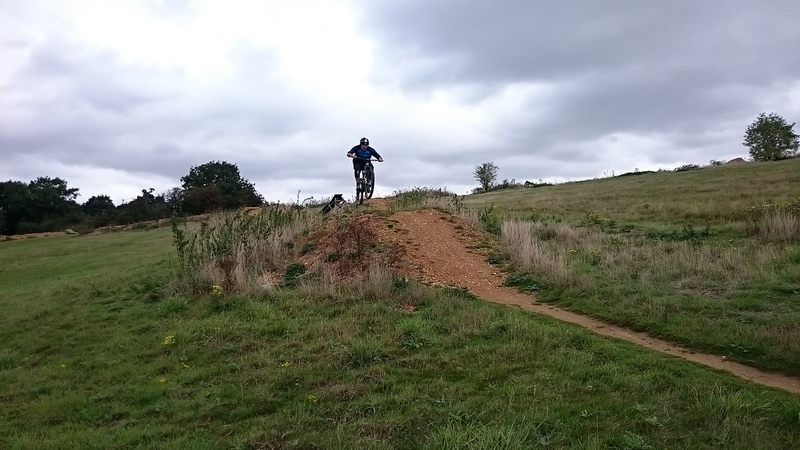 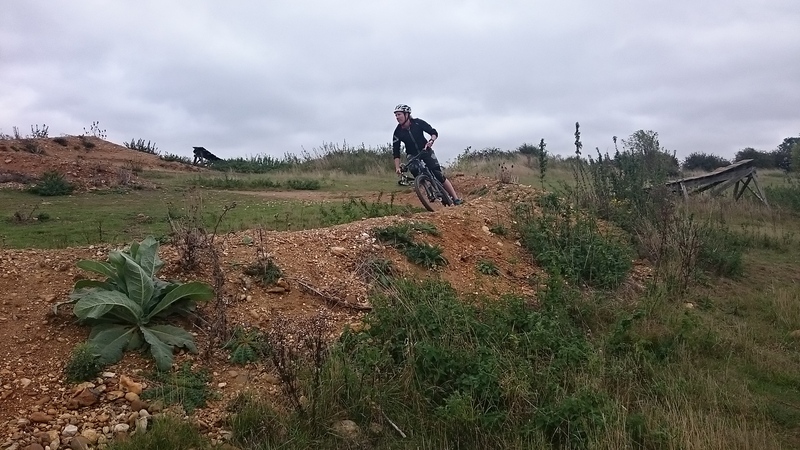 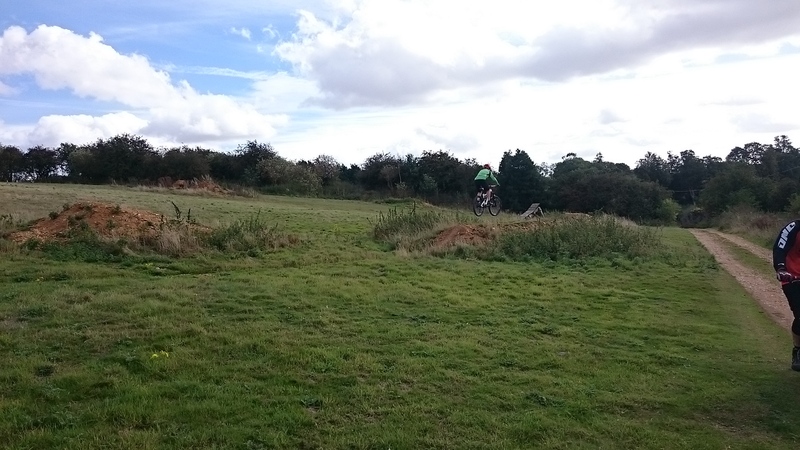 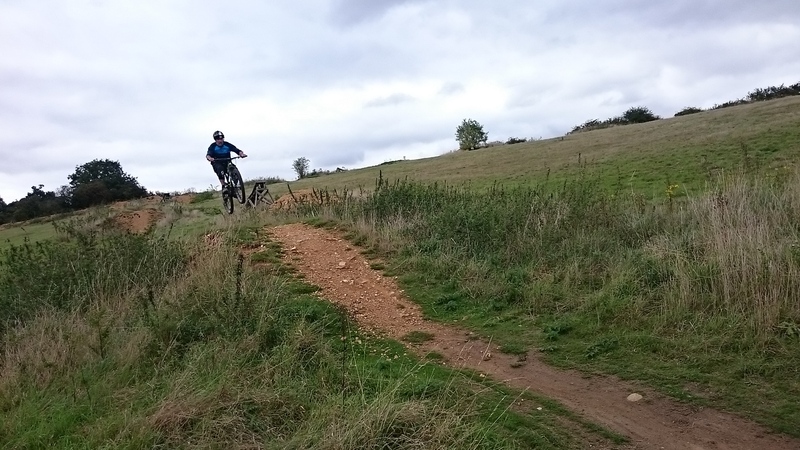 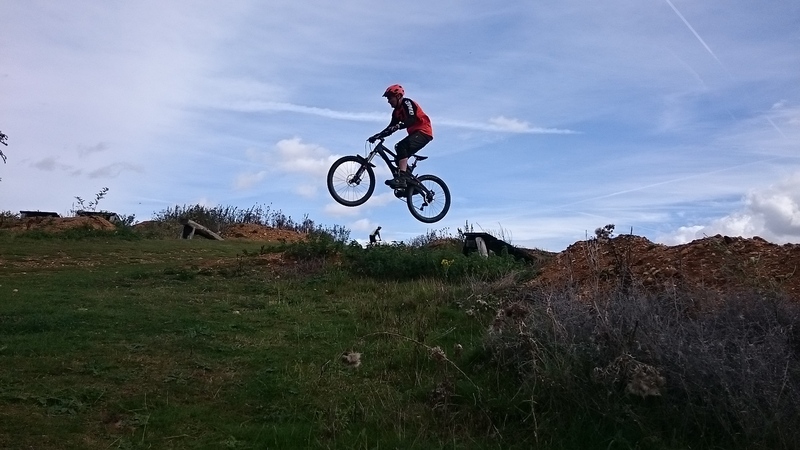 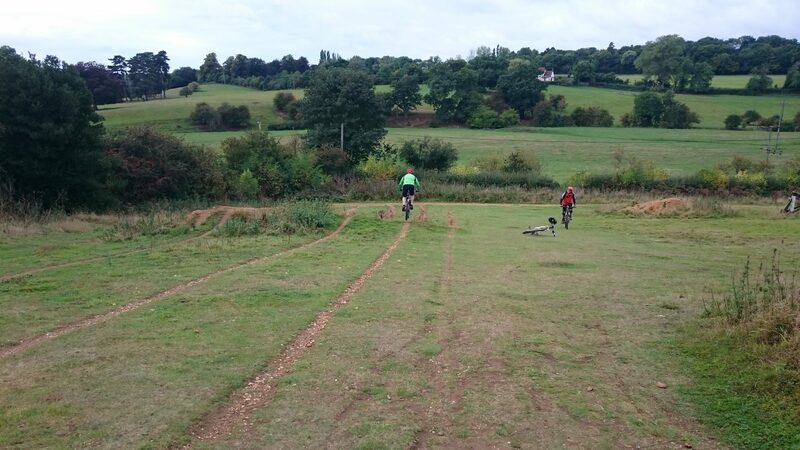 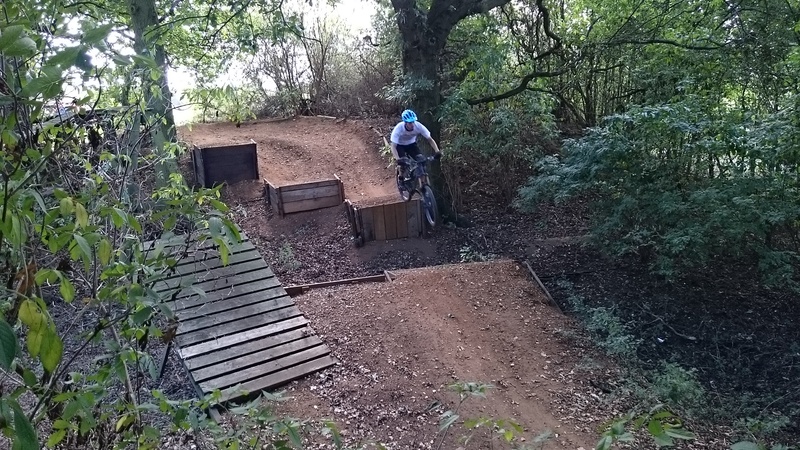 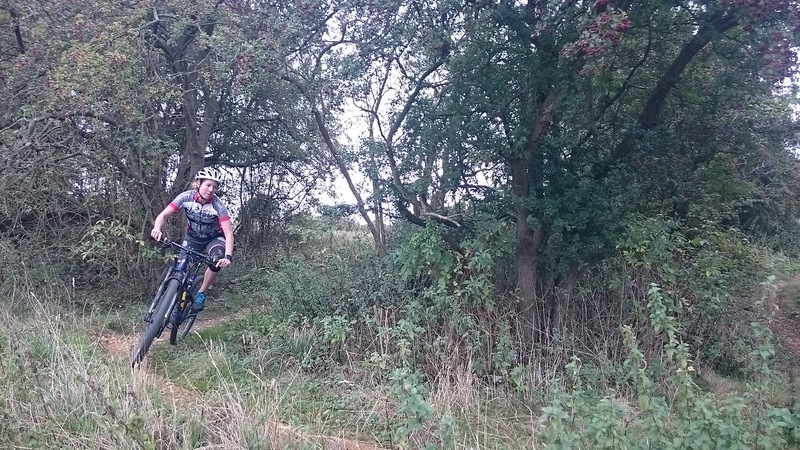 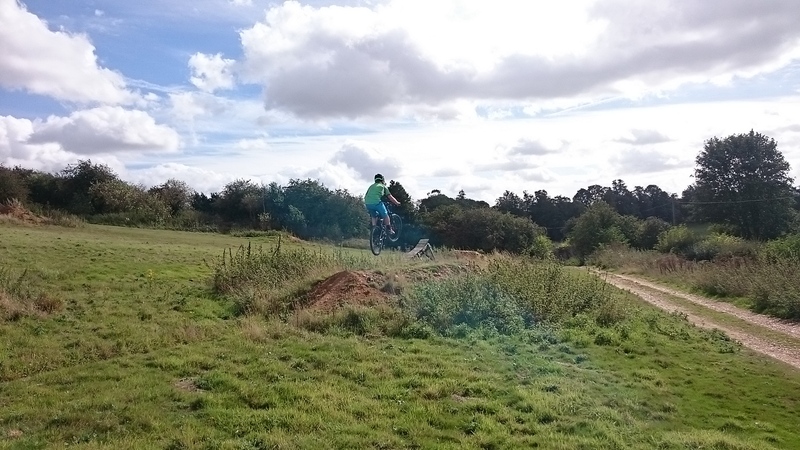 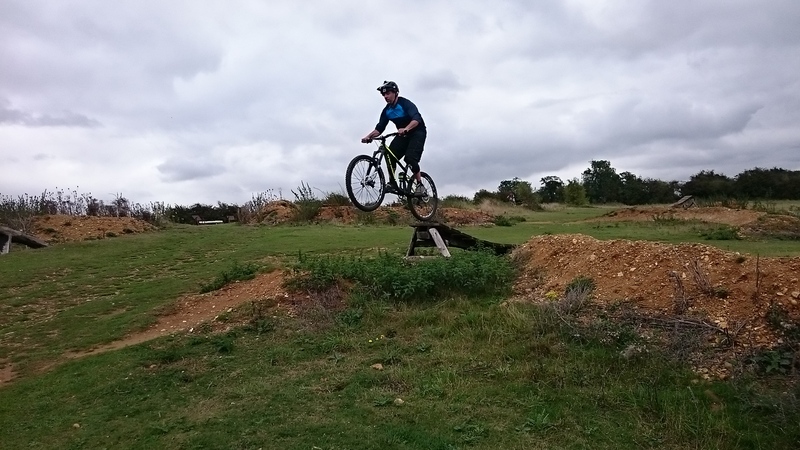 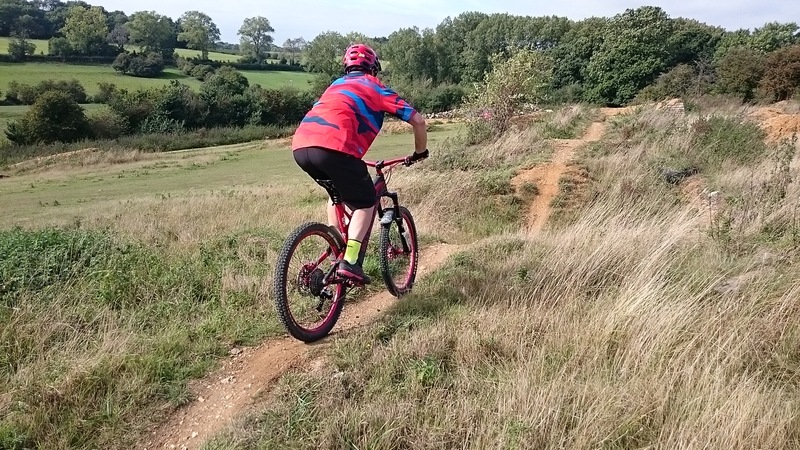 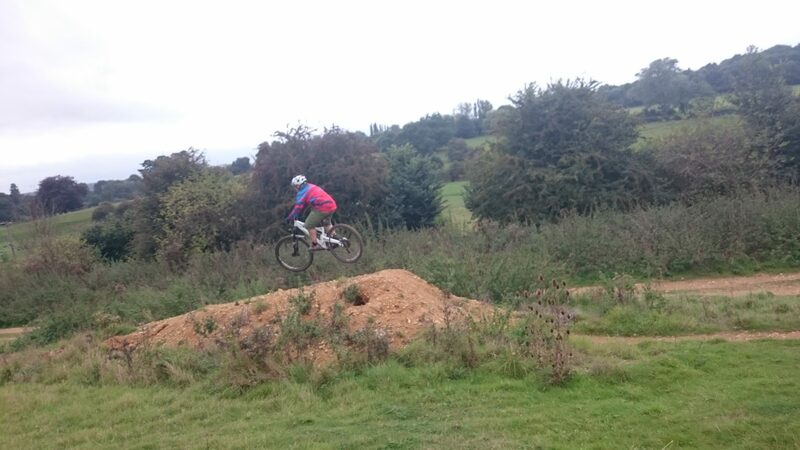 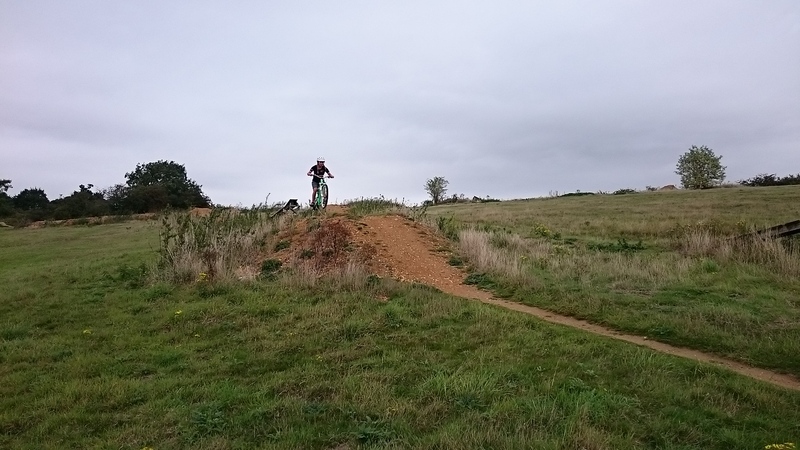 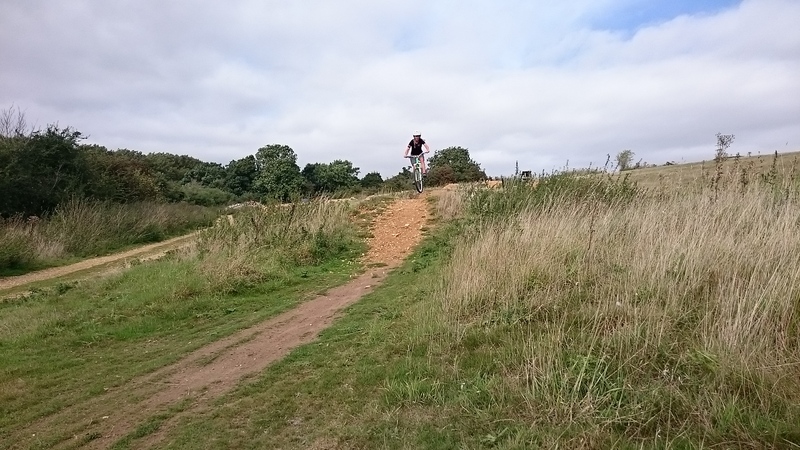 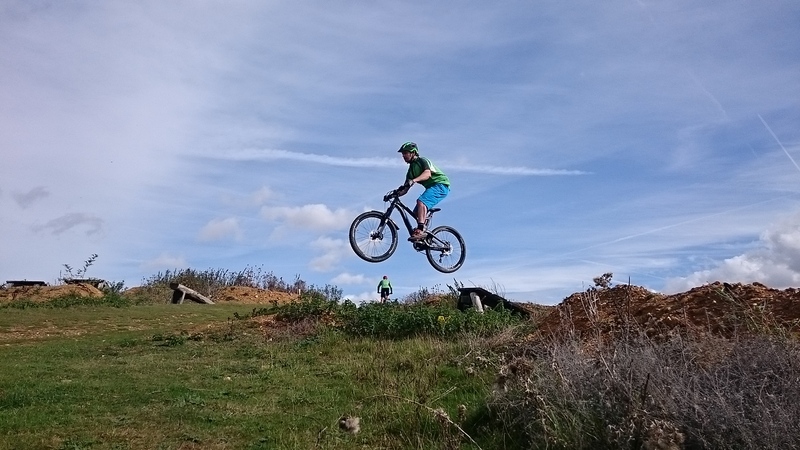 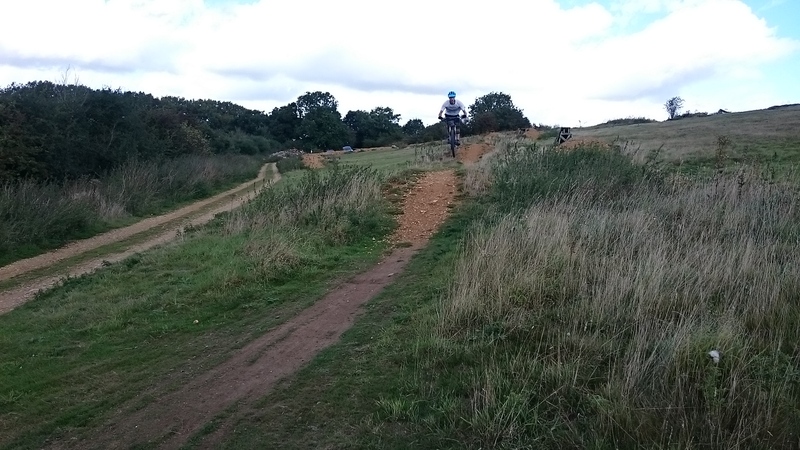 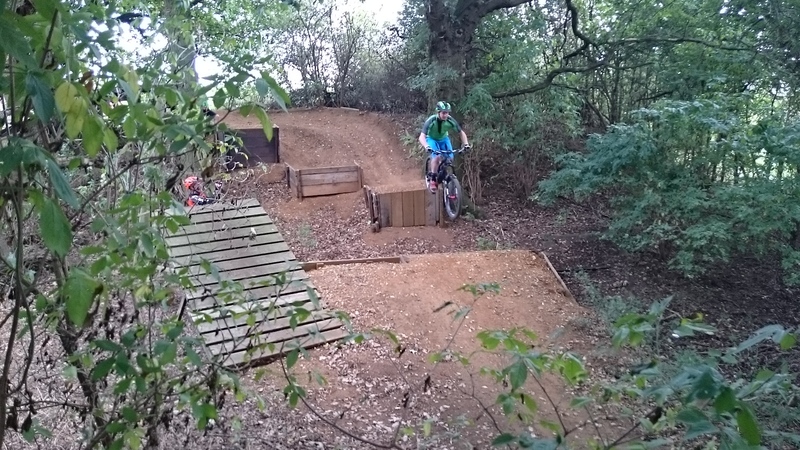 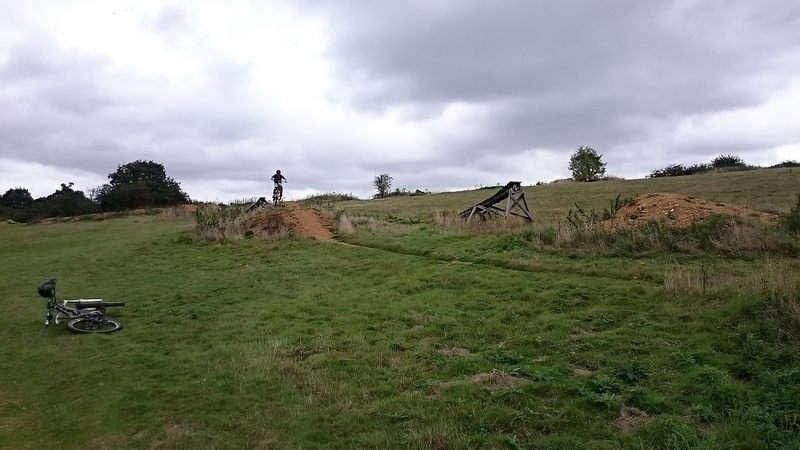 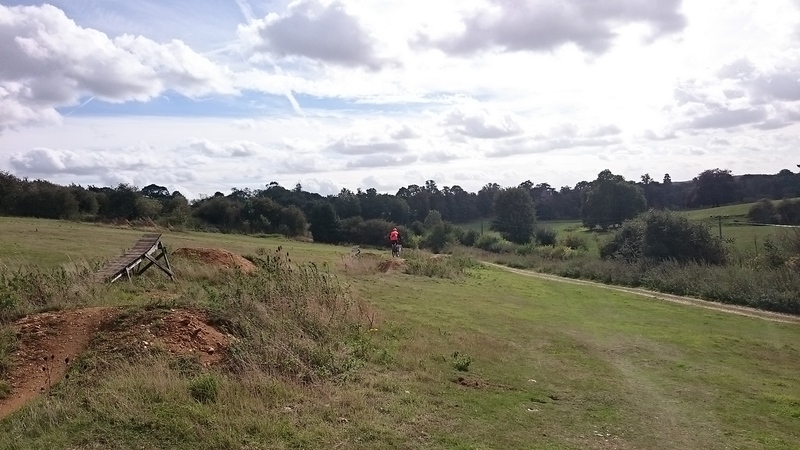 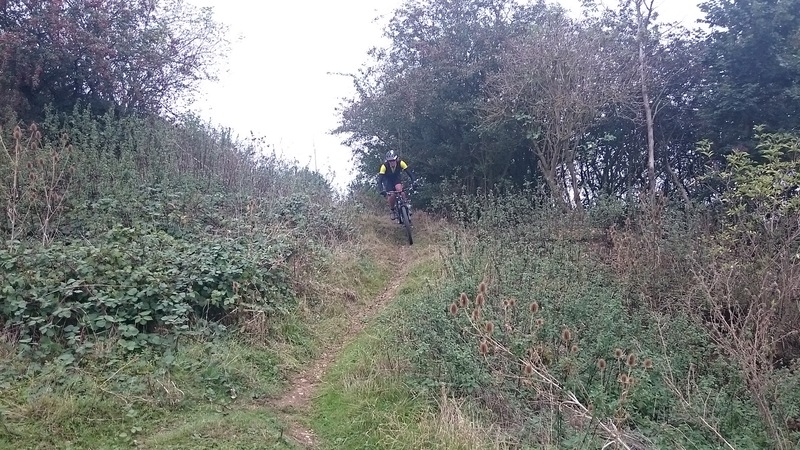 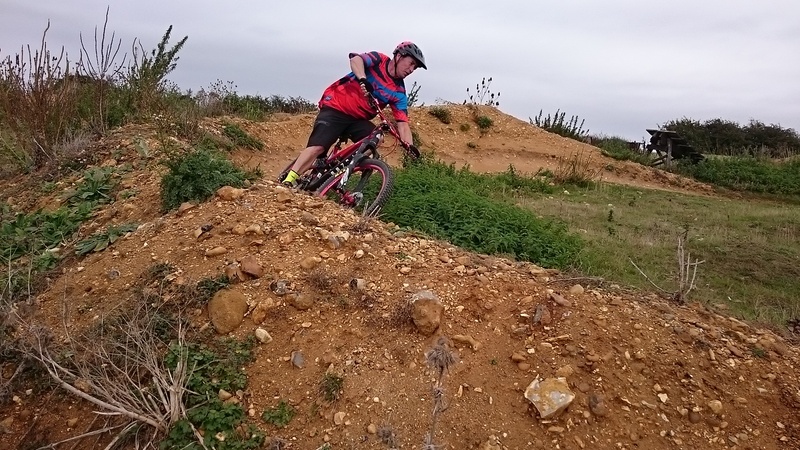 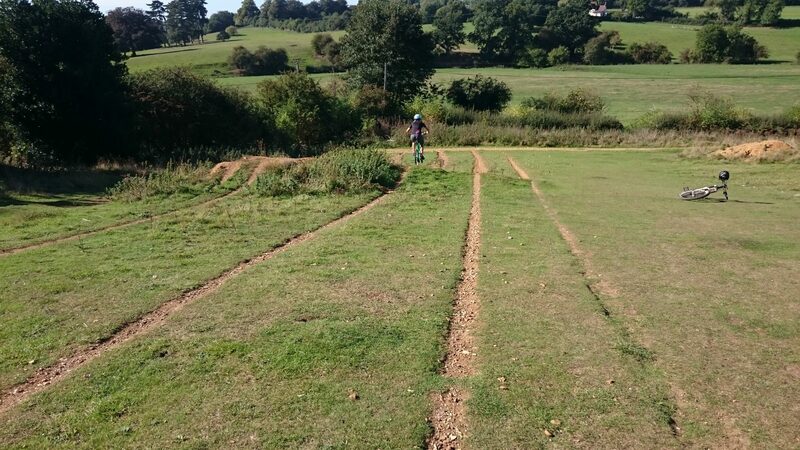 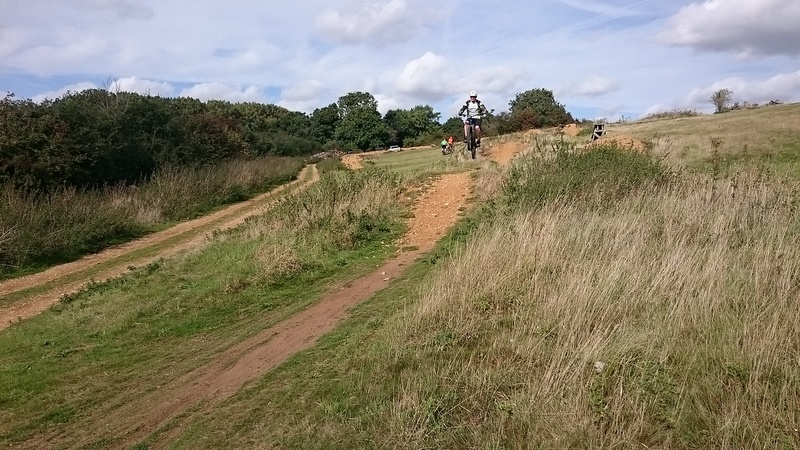 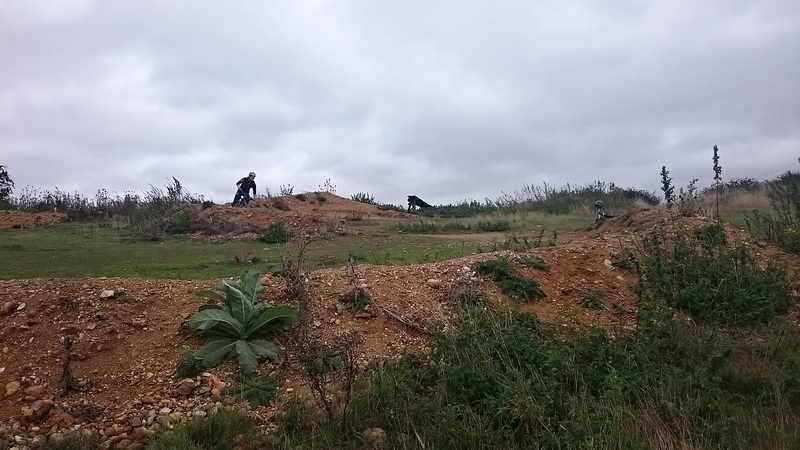 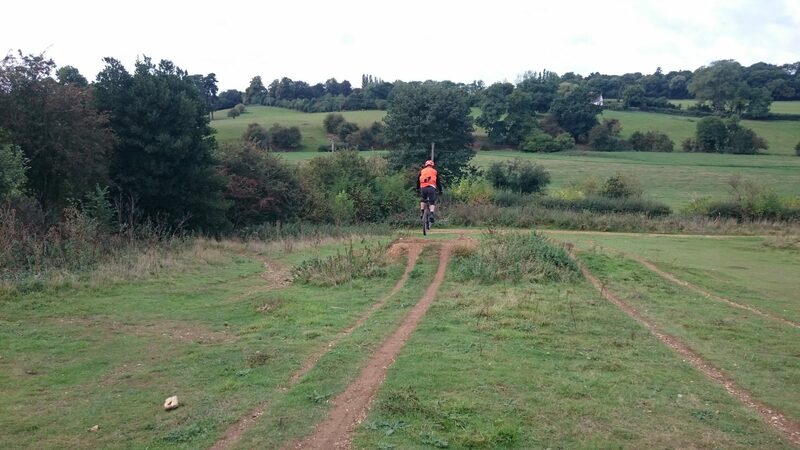 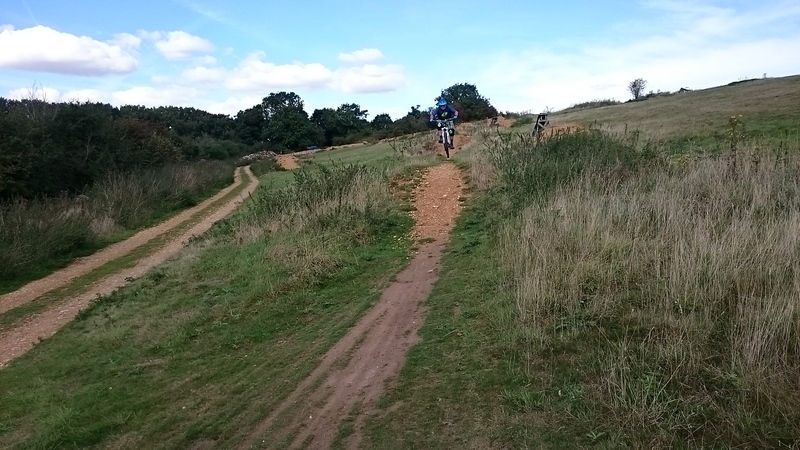 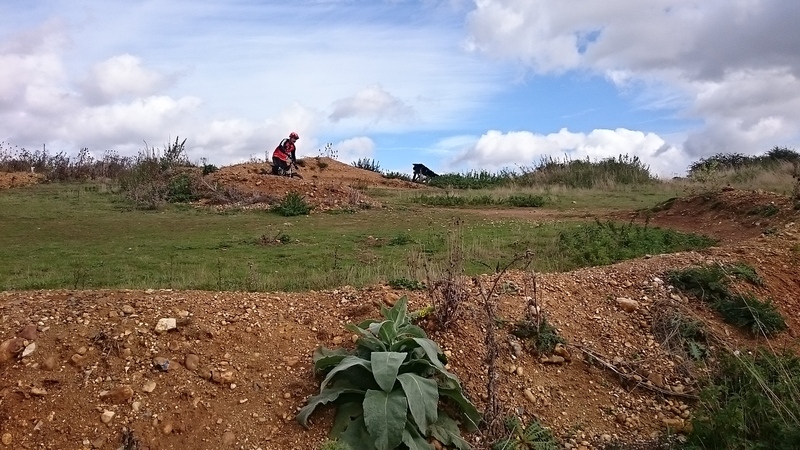 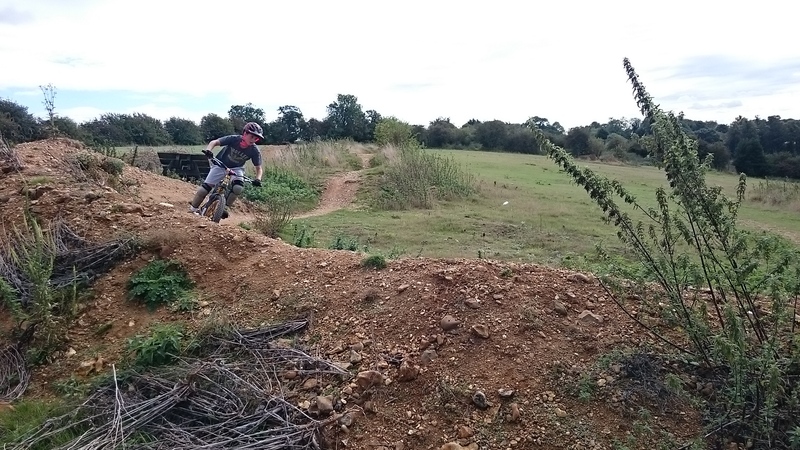 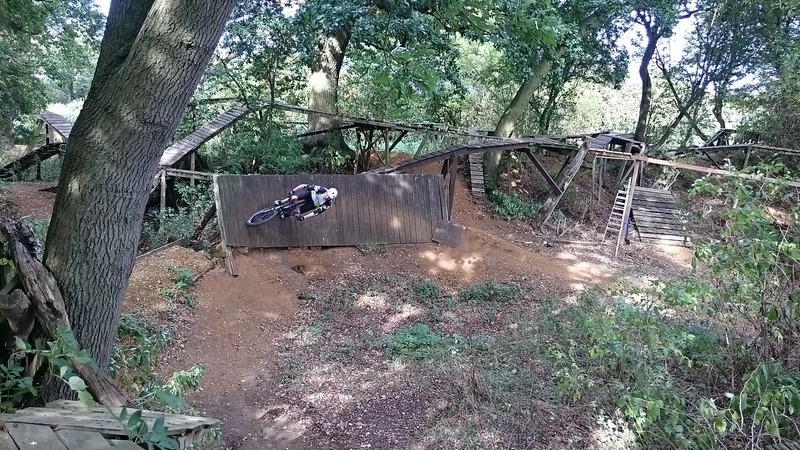 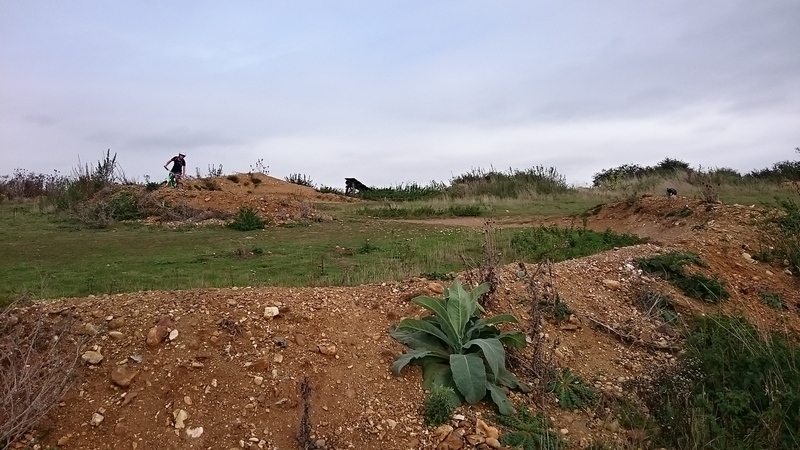 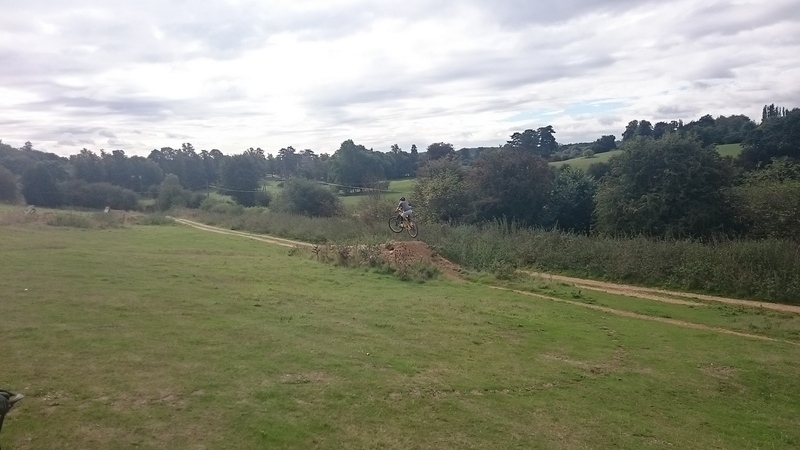 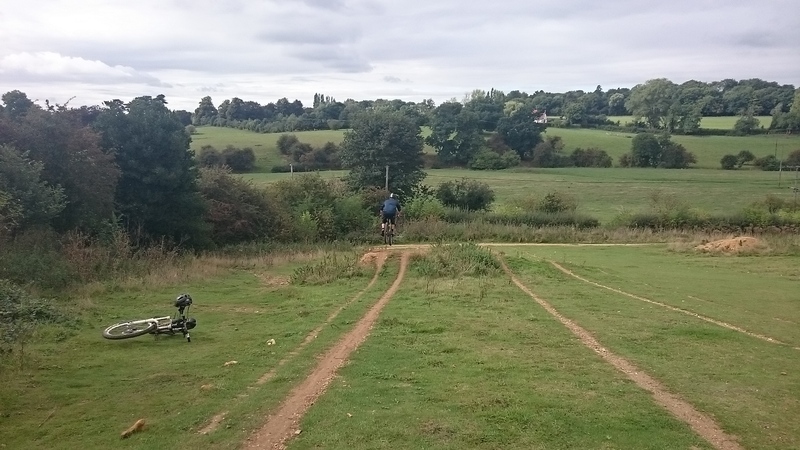 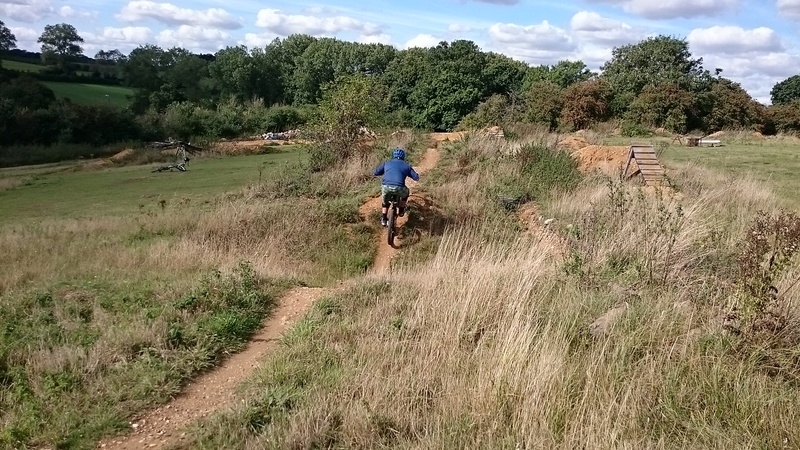 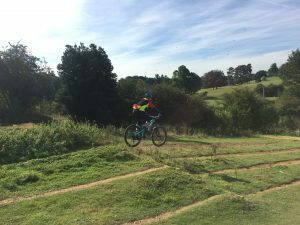 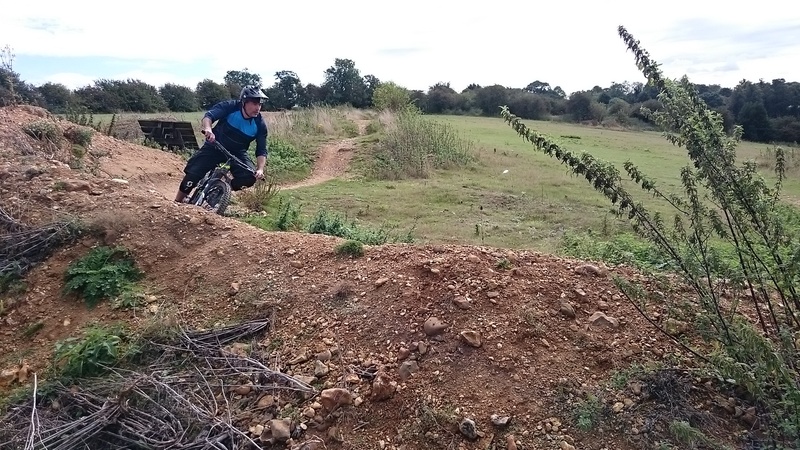 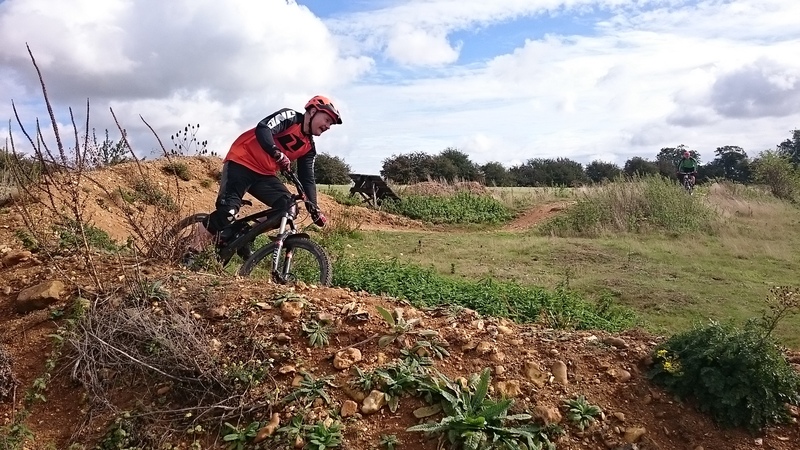 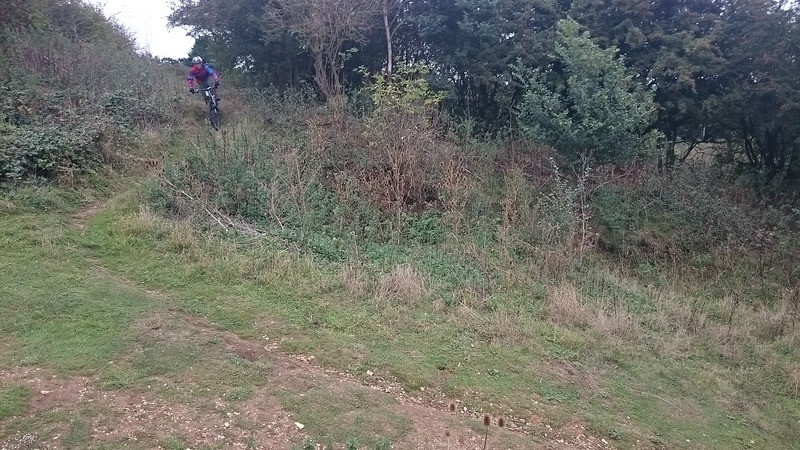 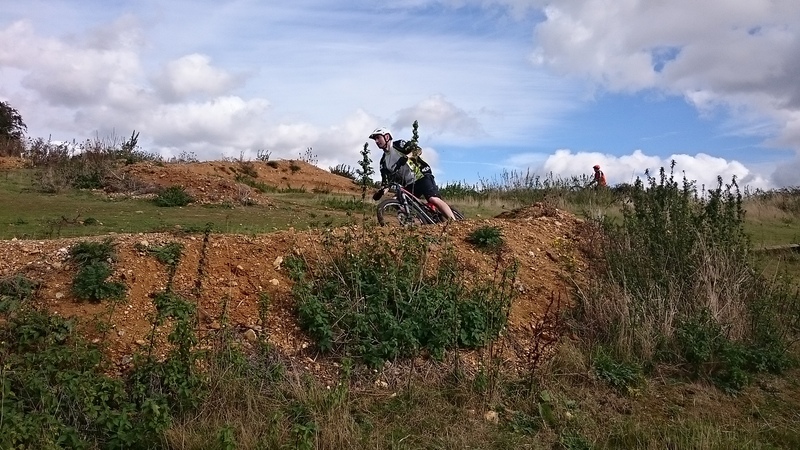 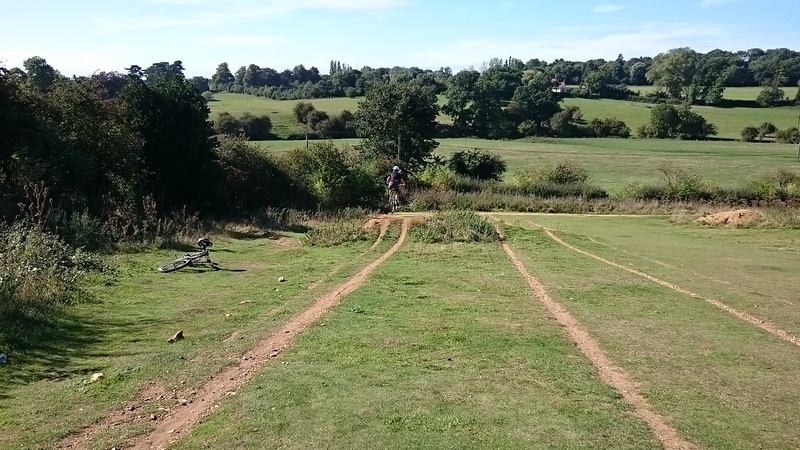 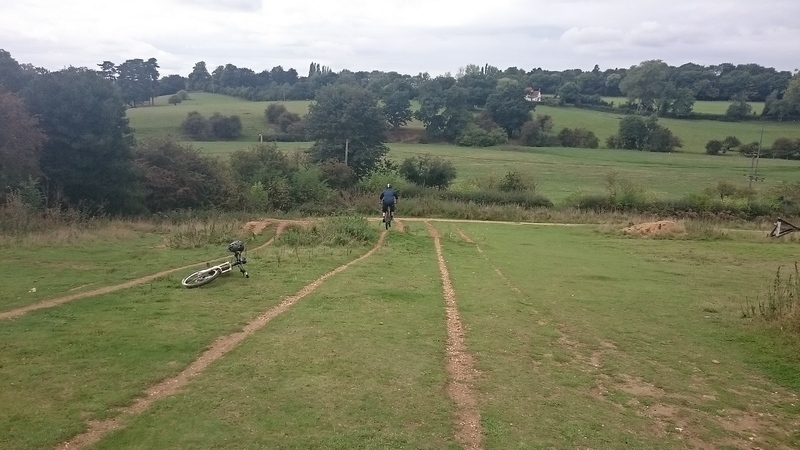 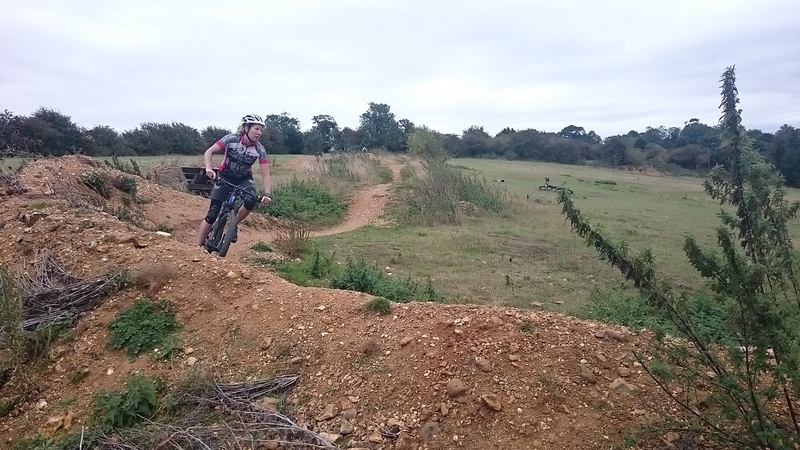 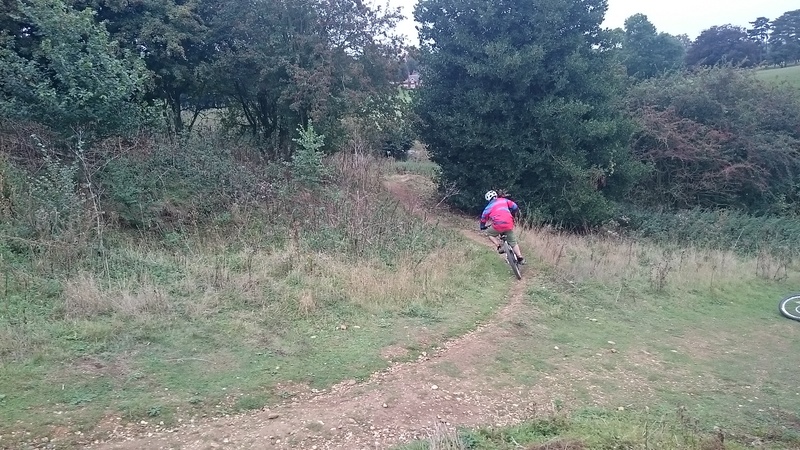 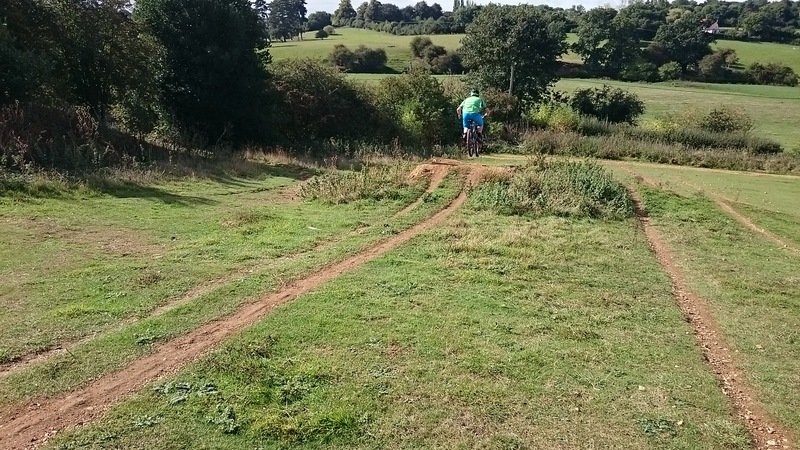 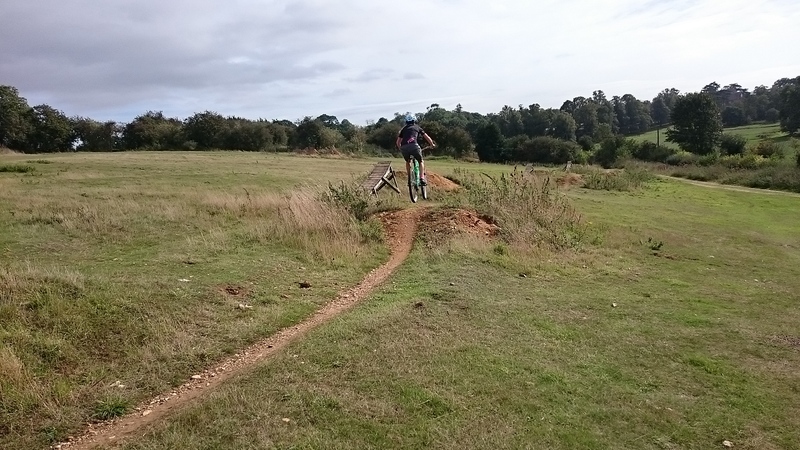 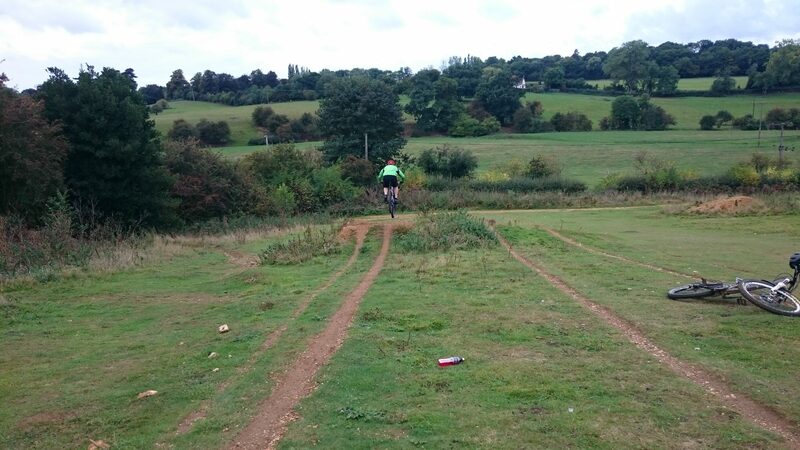 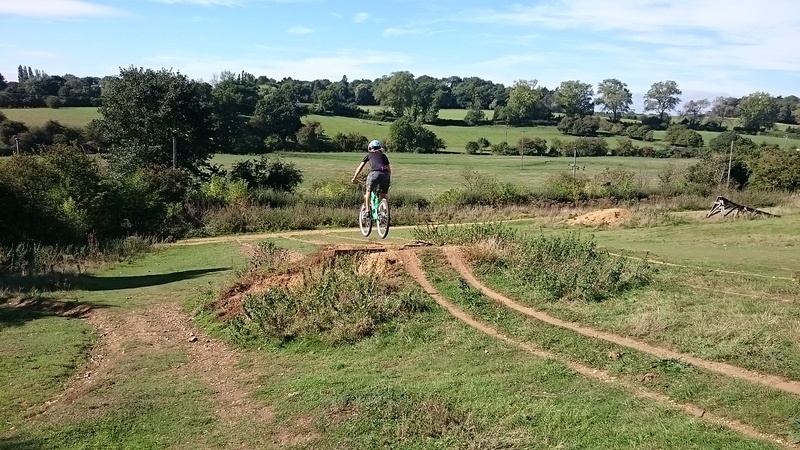 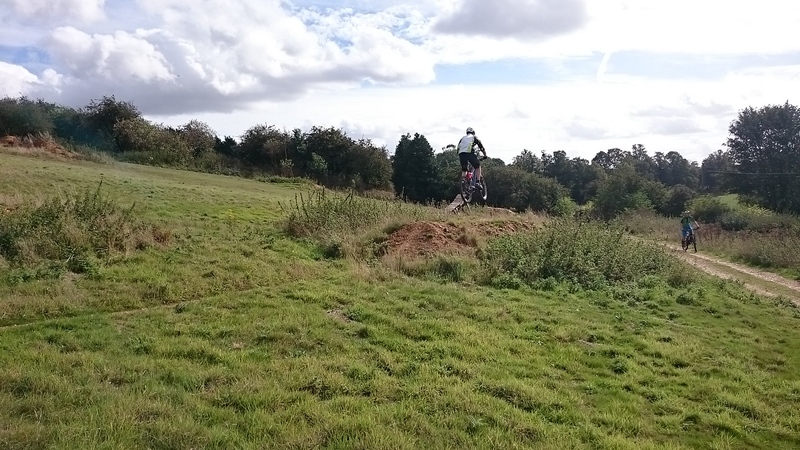 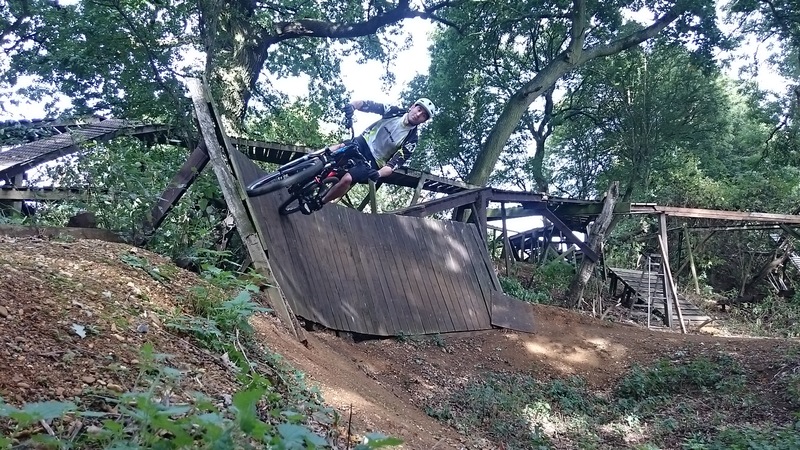 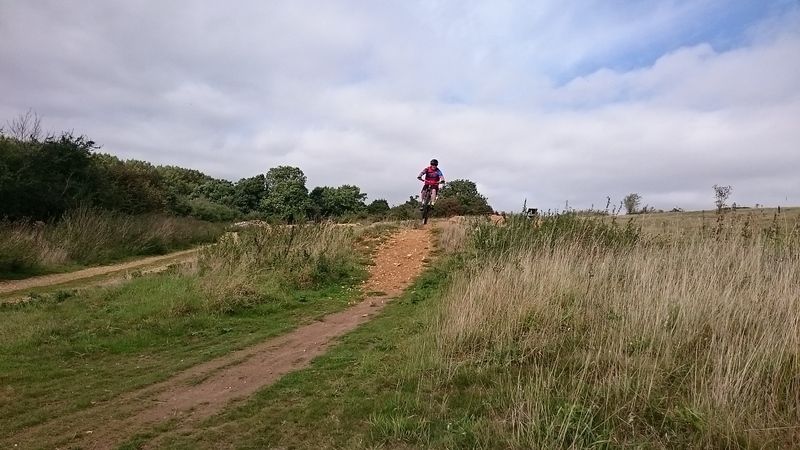 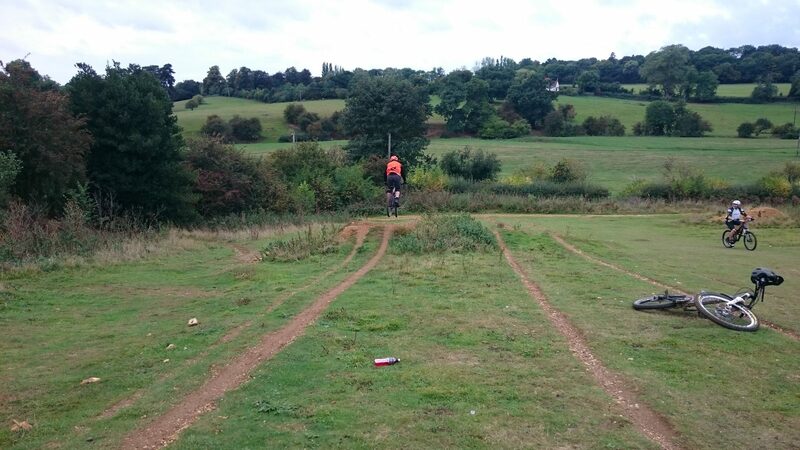 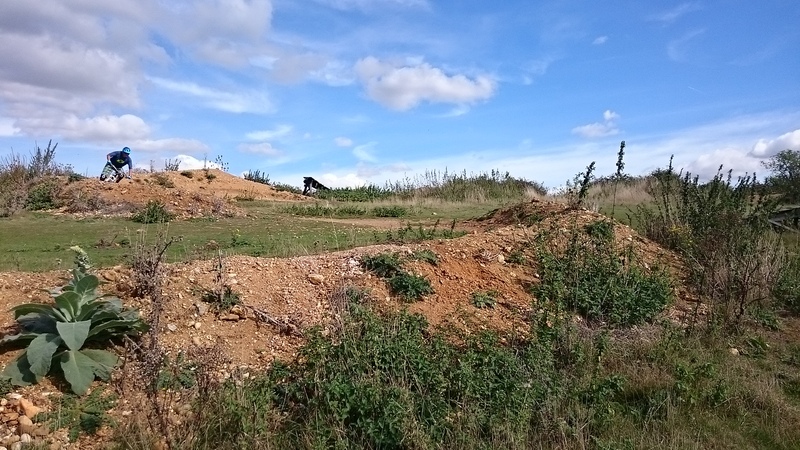 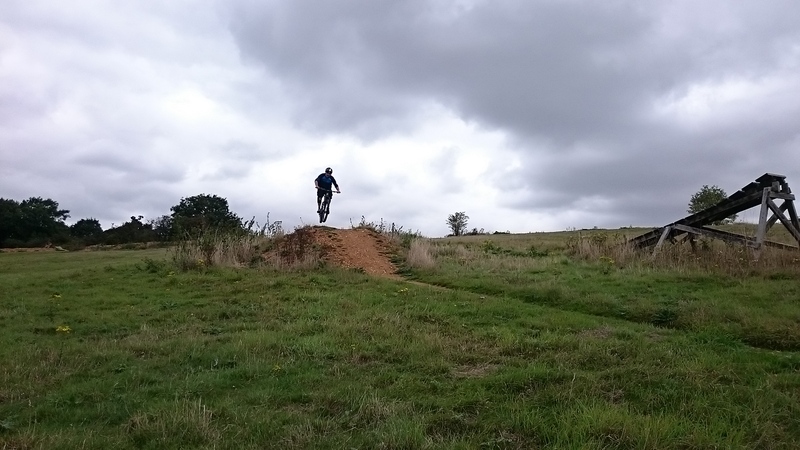 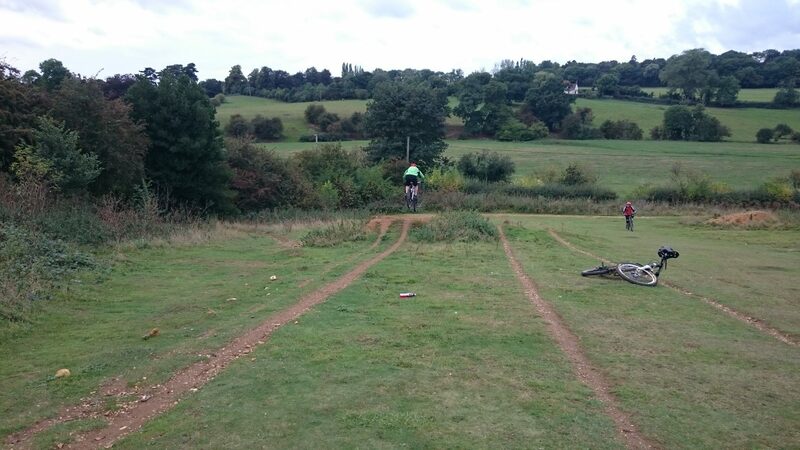 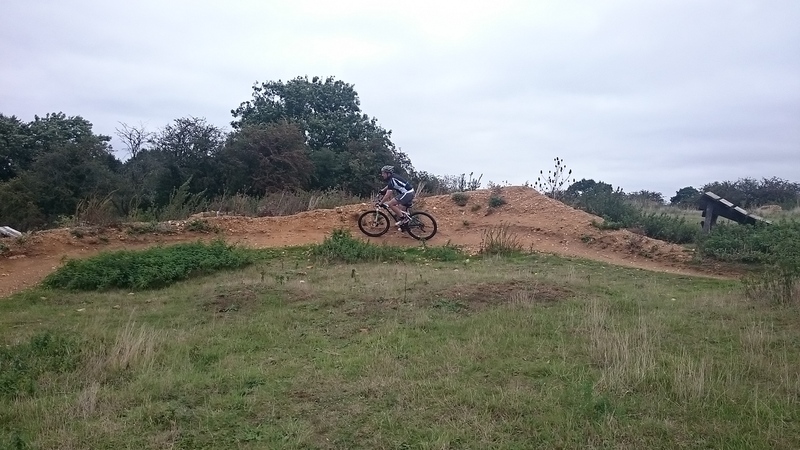 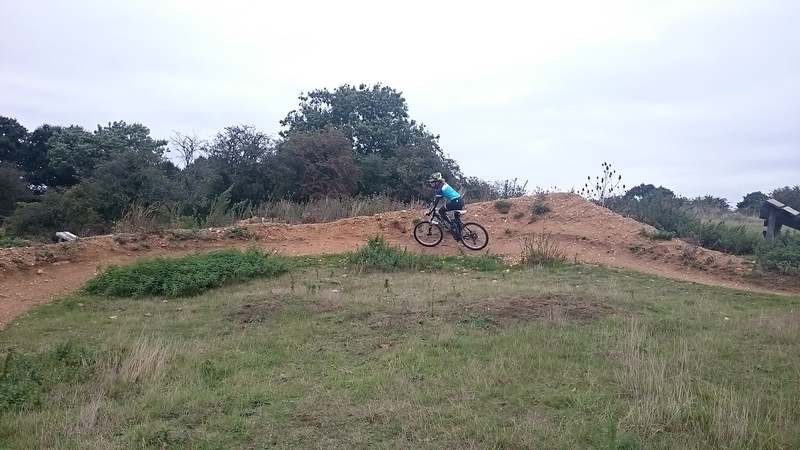 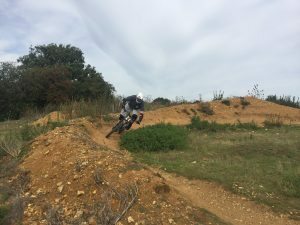 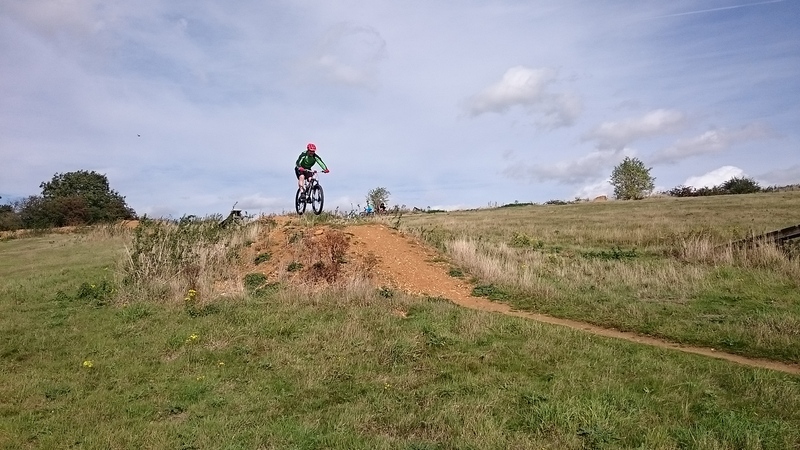 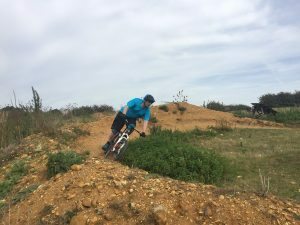 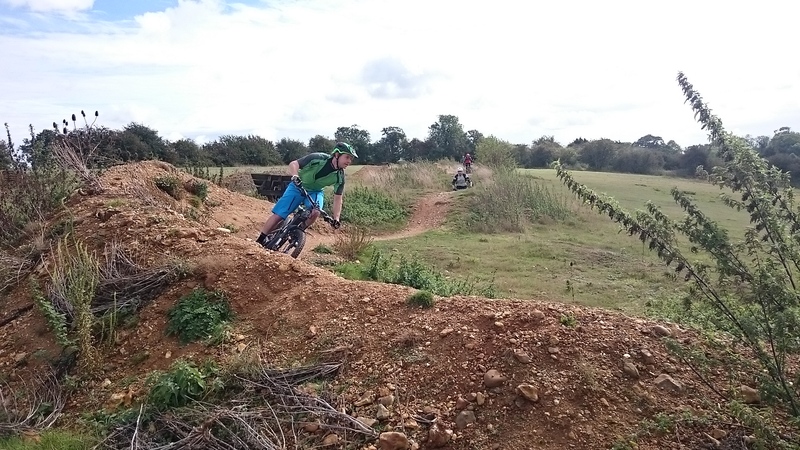 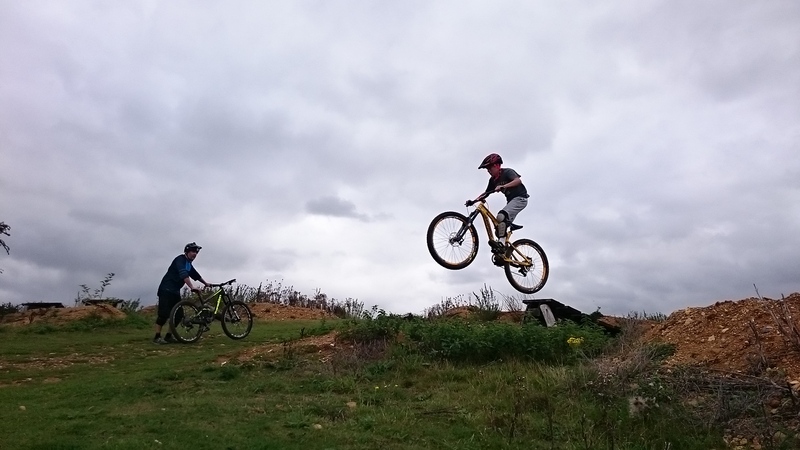 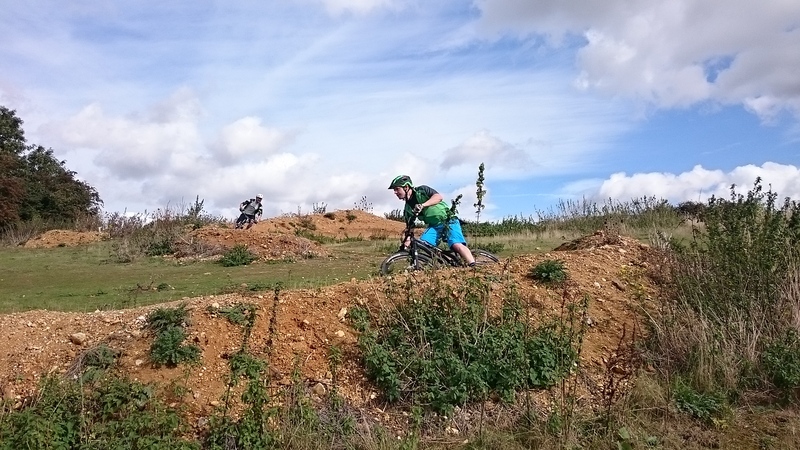 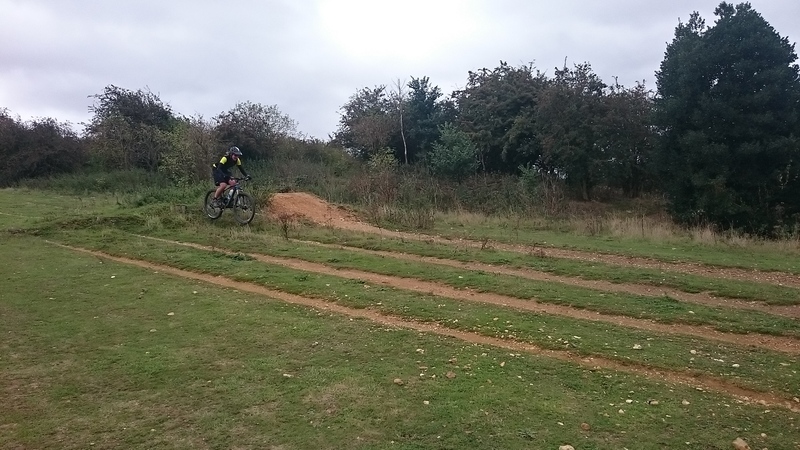 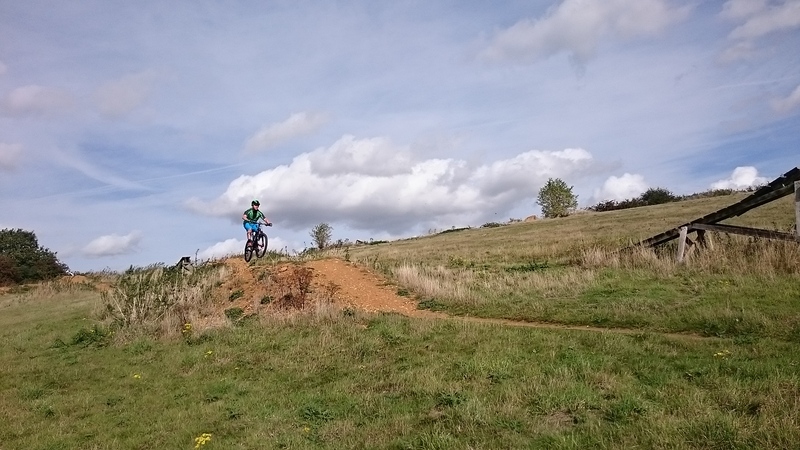 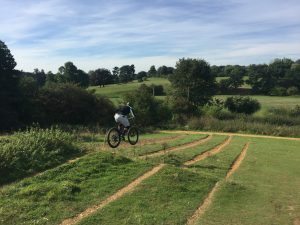 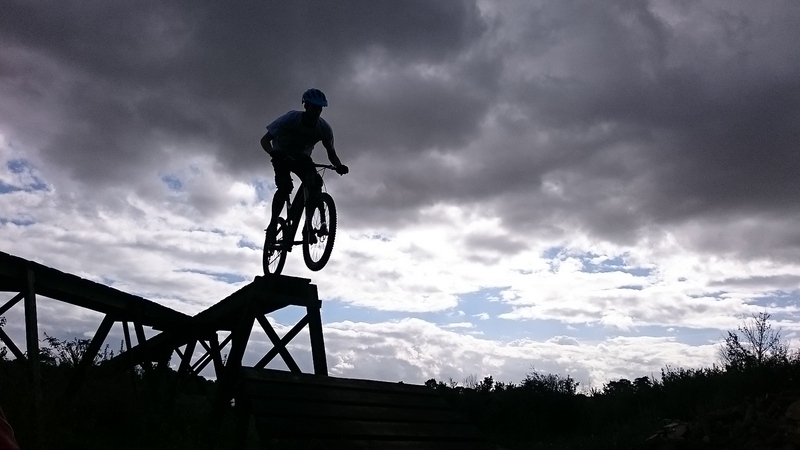 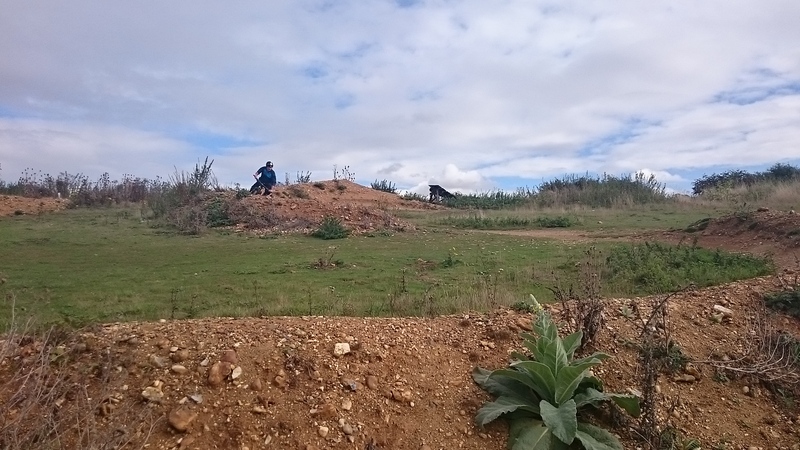 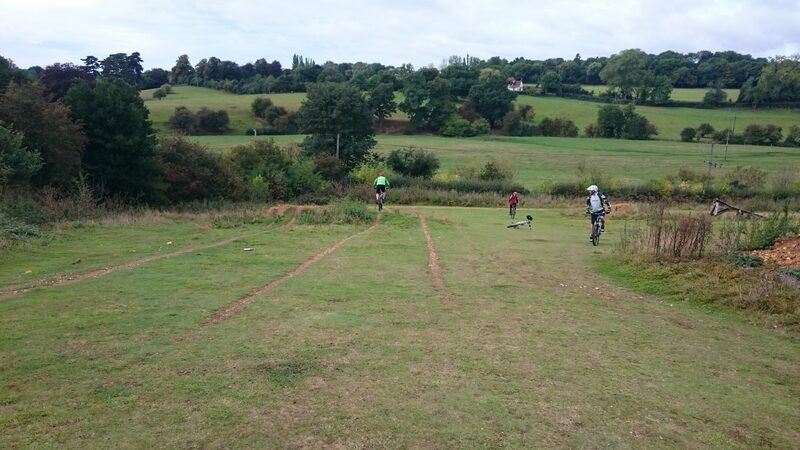 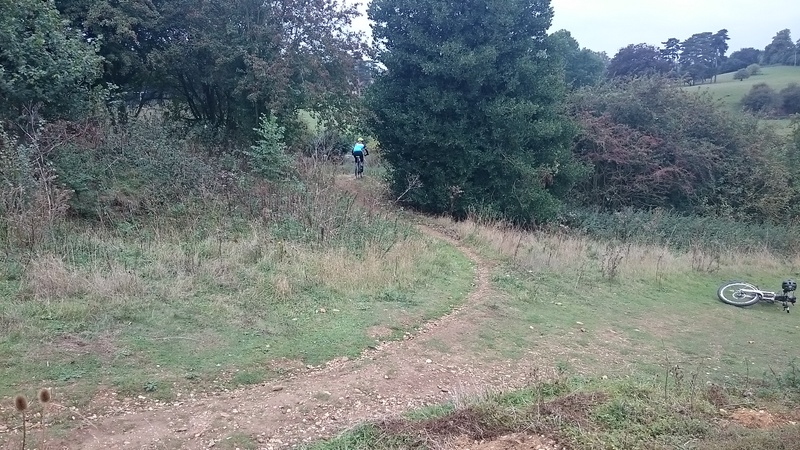 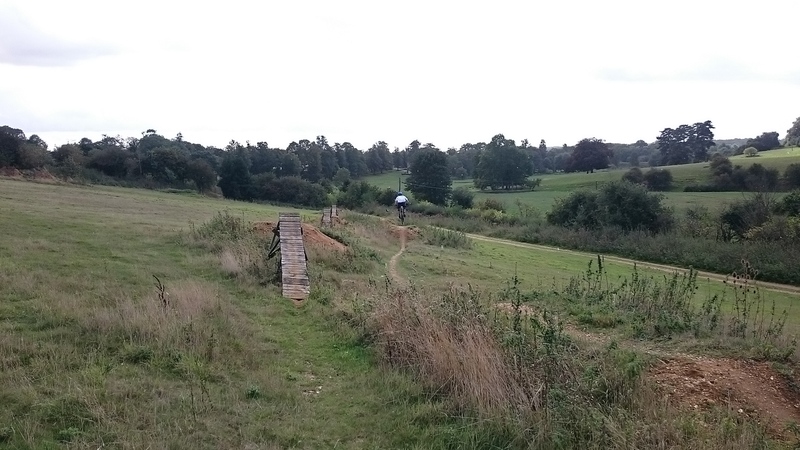 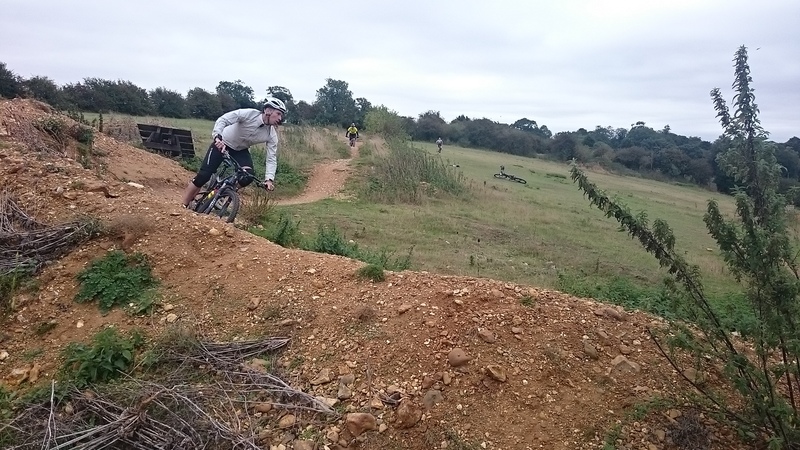 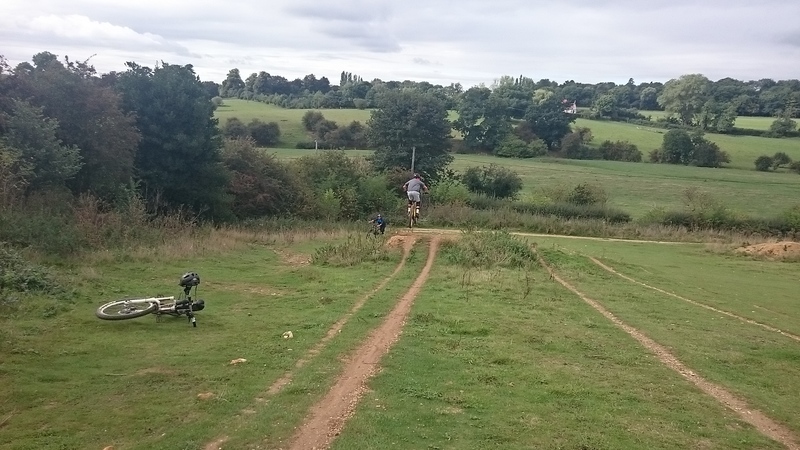 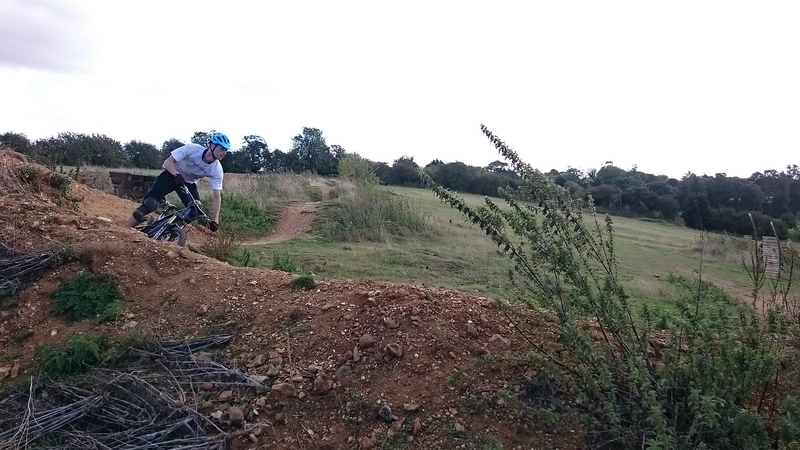 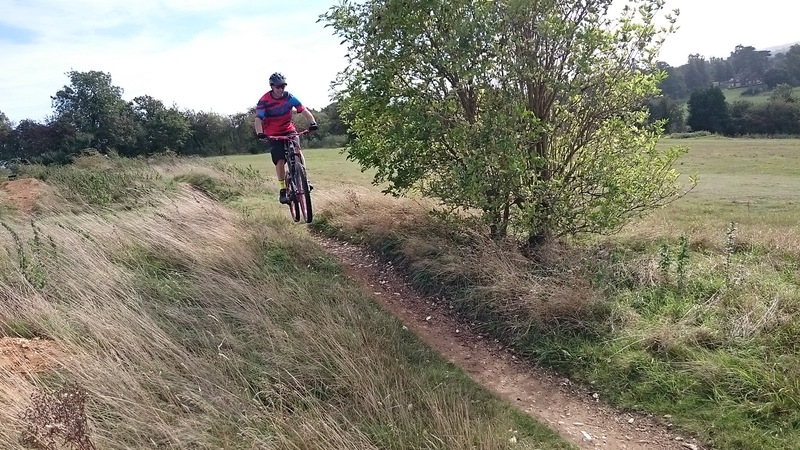 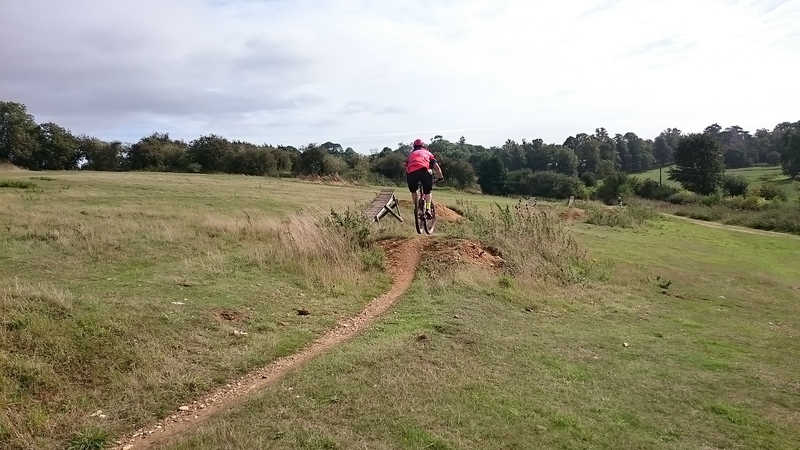 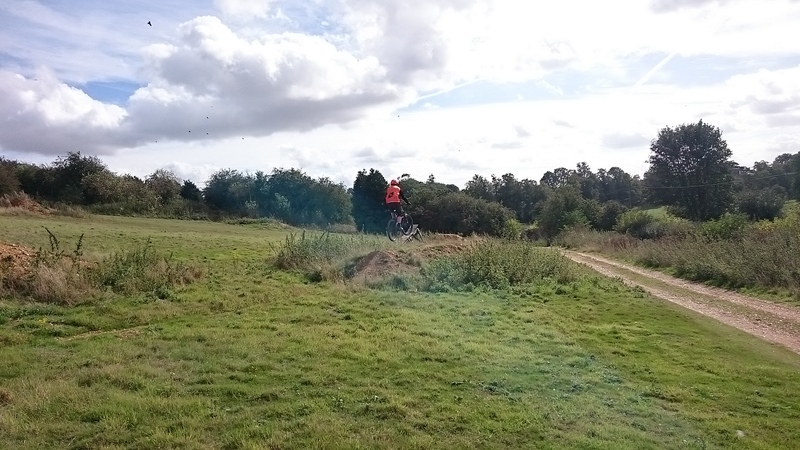 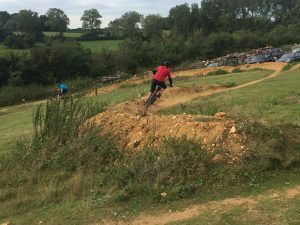 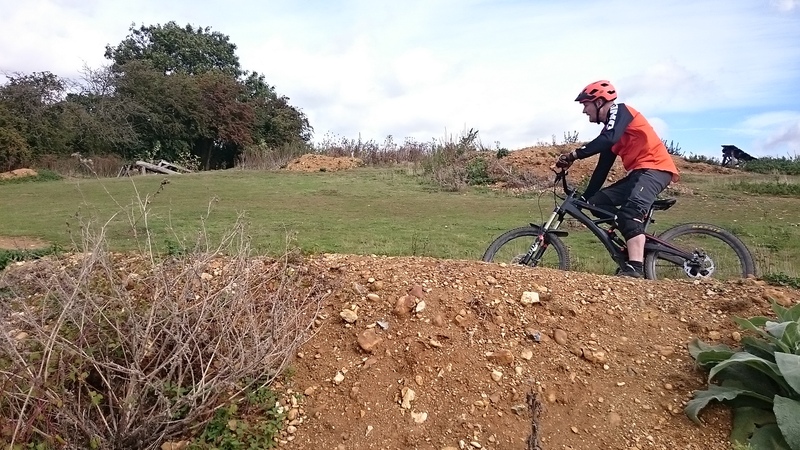 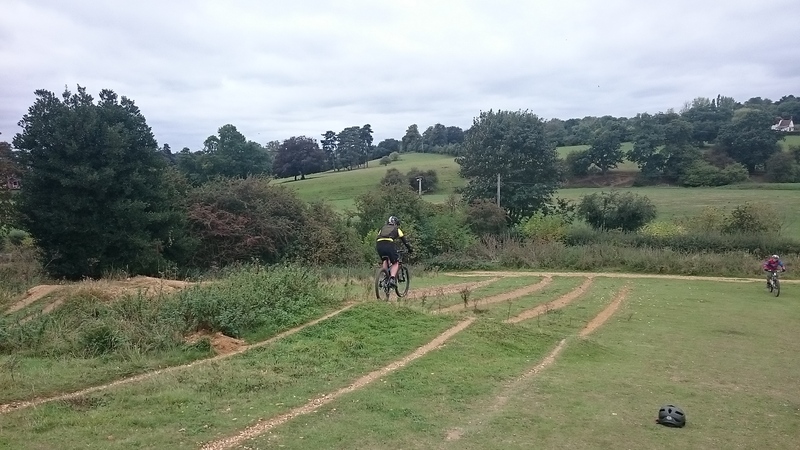 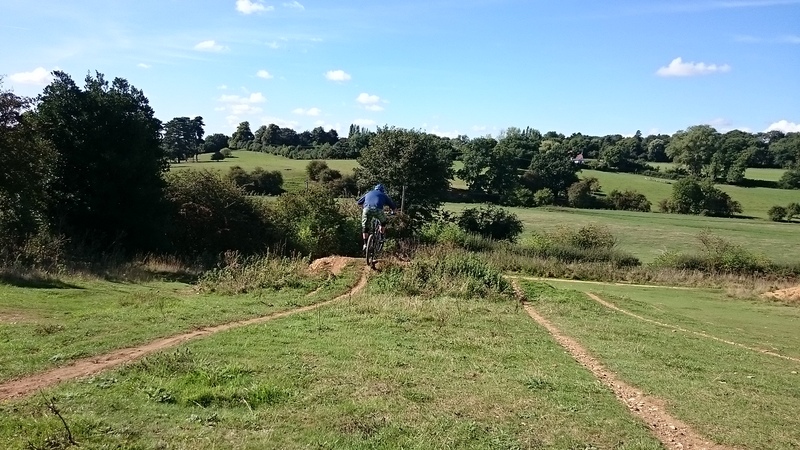 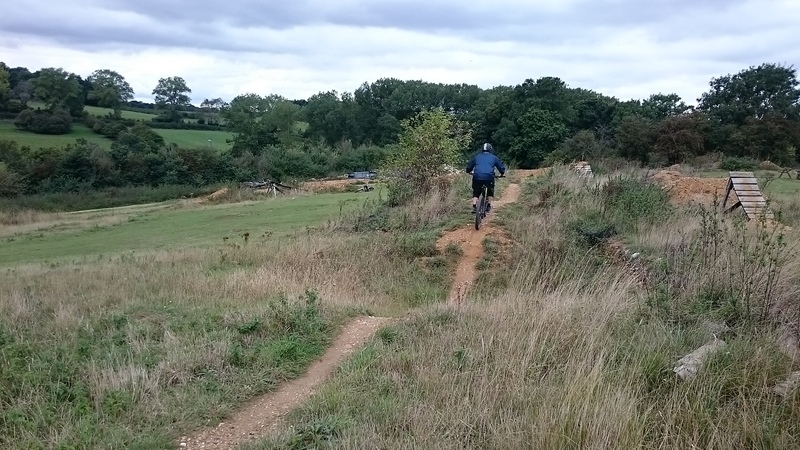 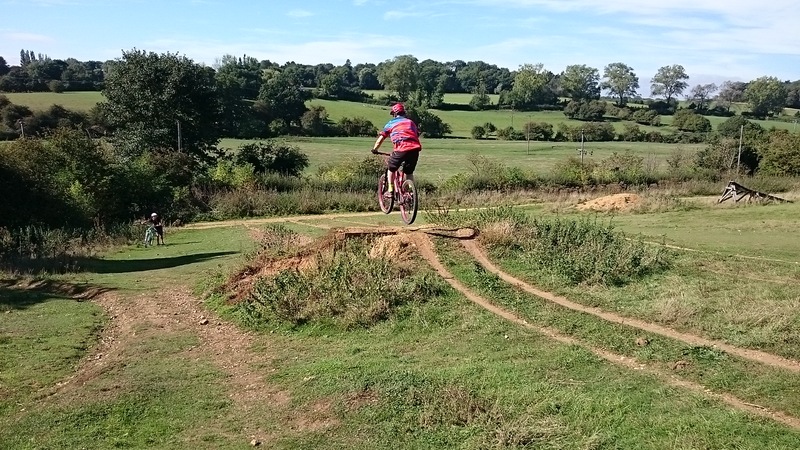 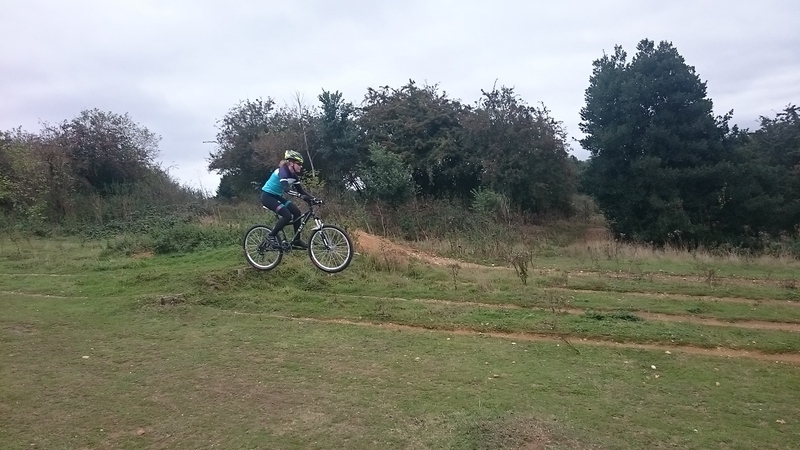 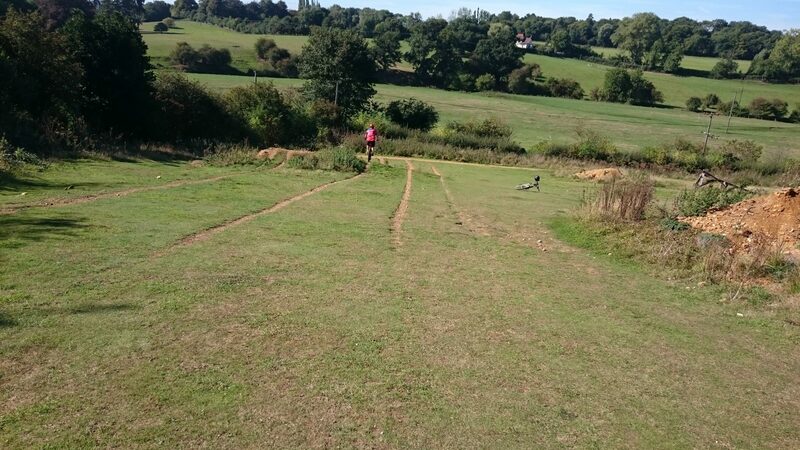 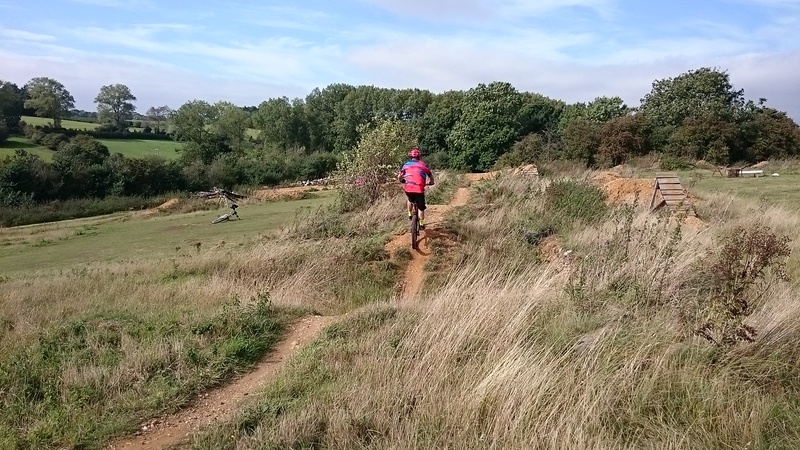 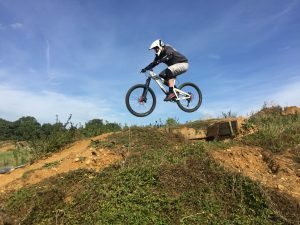 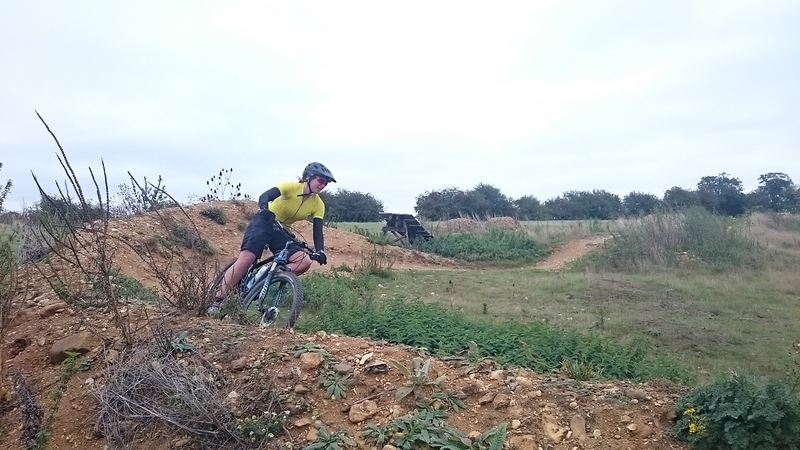 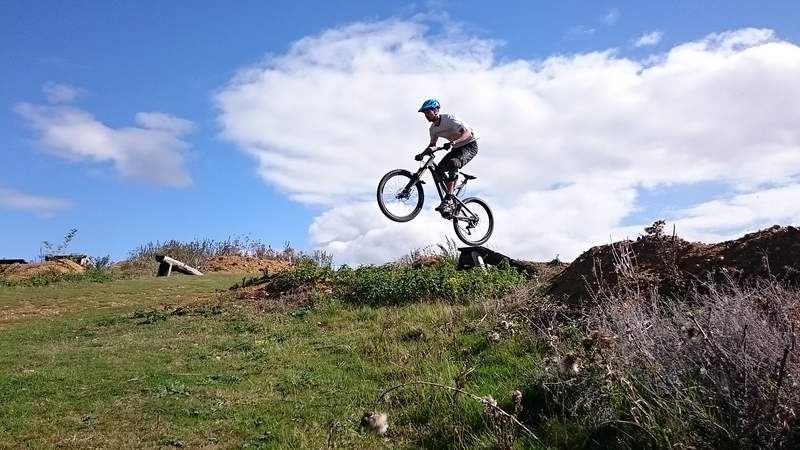 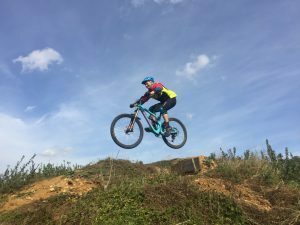 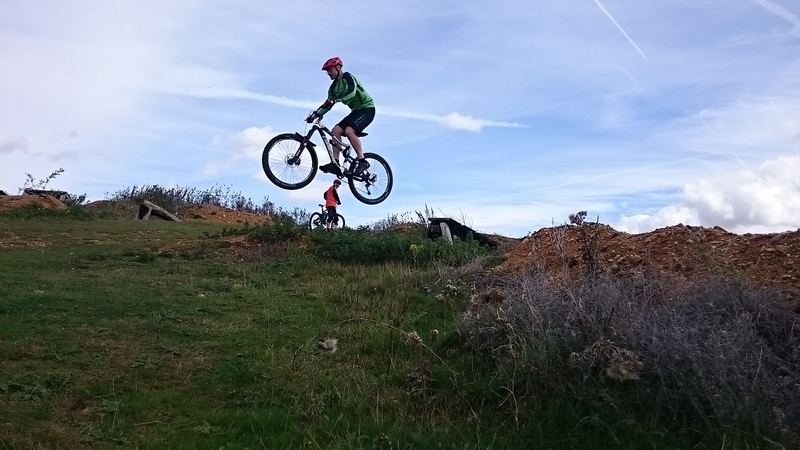 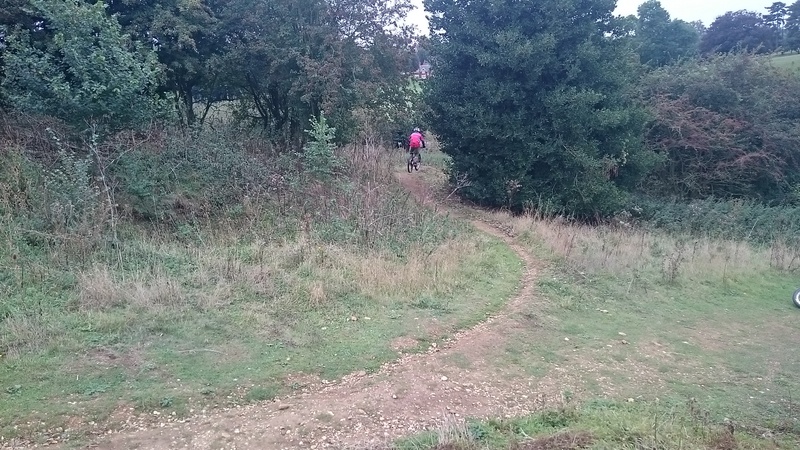 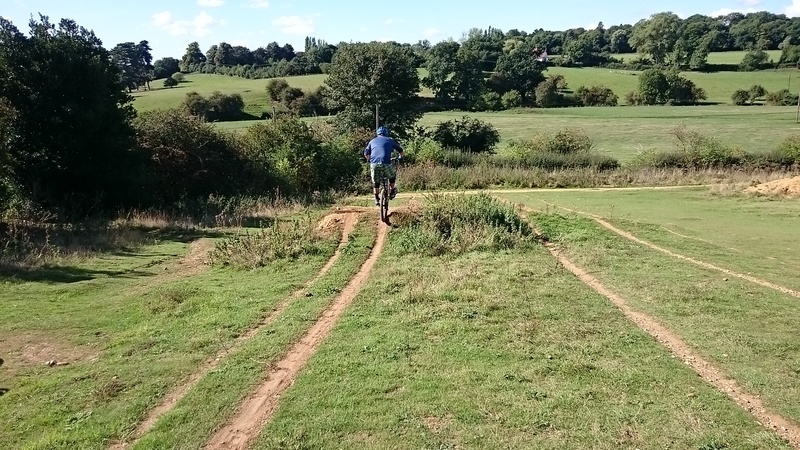 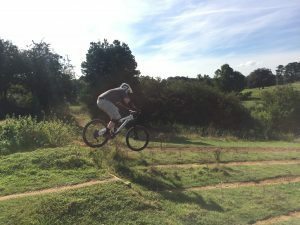 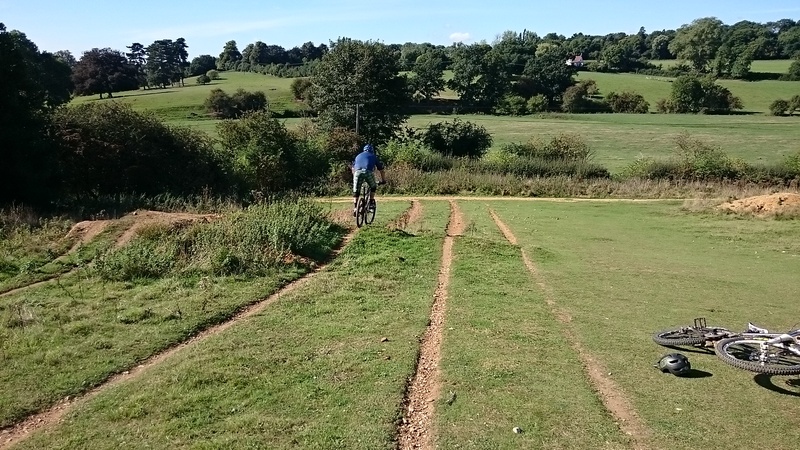 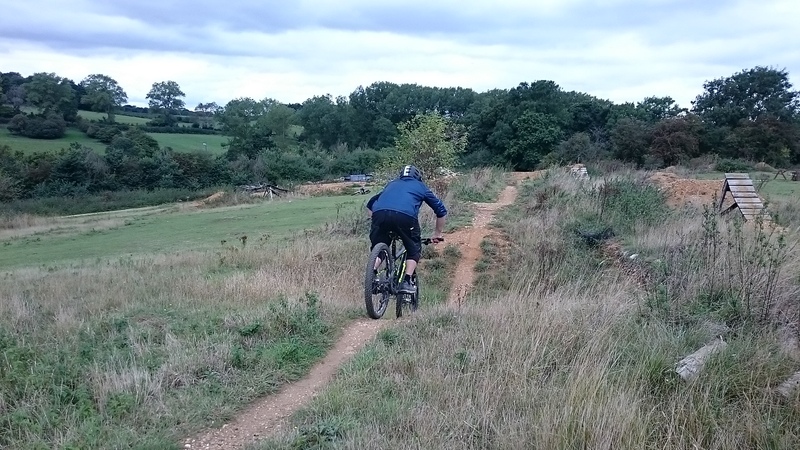 The session built up to linking jumps,gaps, drops and berms and even woodwork trails too. 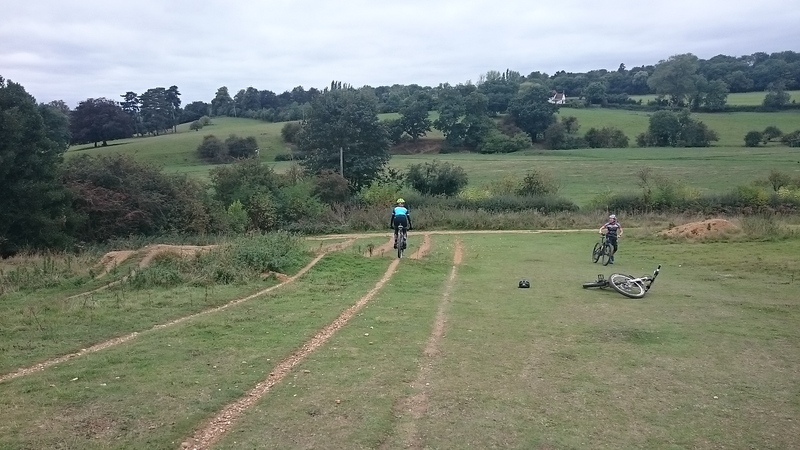 Dom, Neil, Dave and Martin came to me to develop their riding. 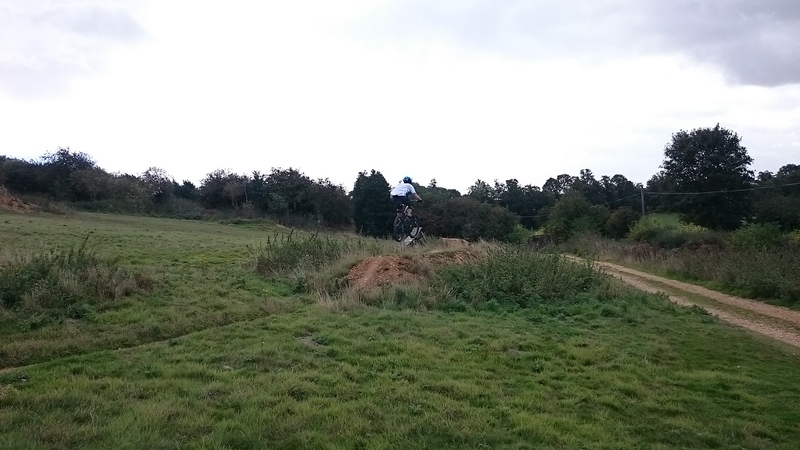 They wanted to gain confidence when getting in the air and maybe jump a gap or two. 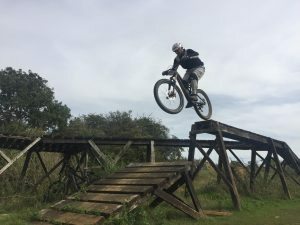 I worked on the physical skills before working on the mental skills. 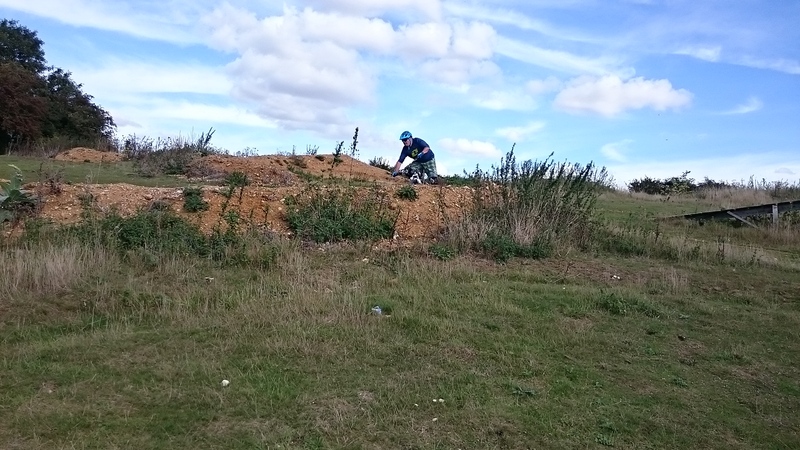 The session started with drops, tabletop and 6ft gap jump and afterwards I began correcting their cornering. 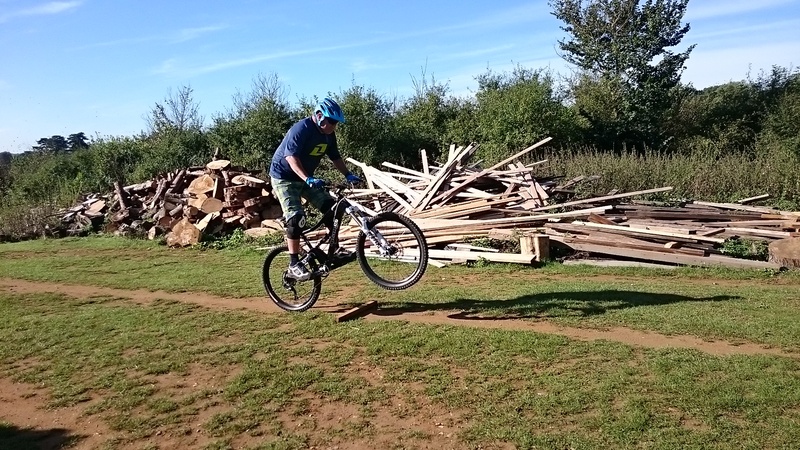 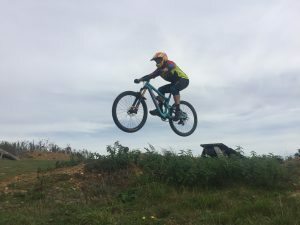 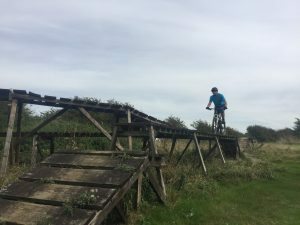 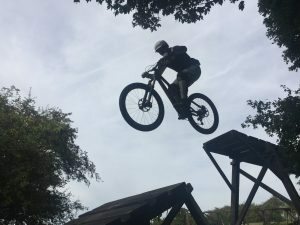 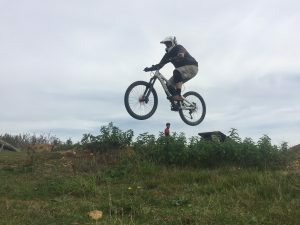 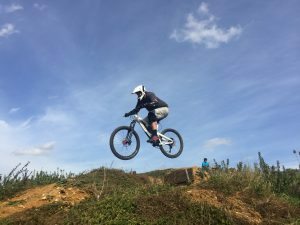 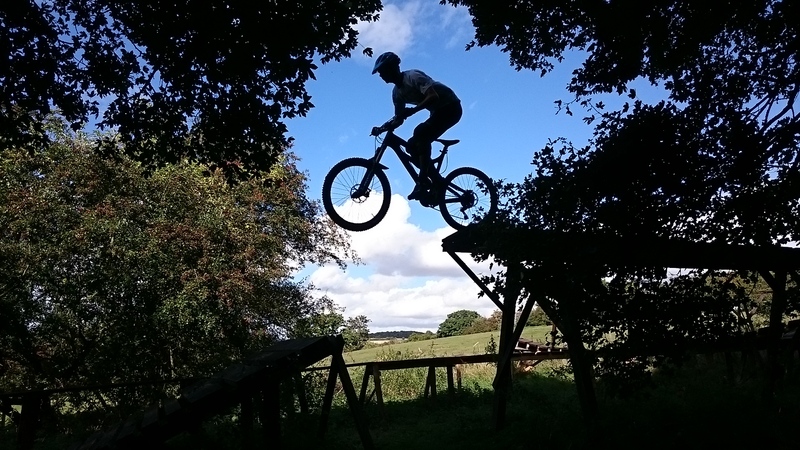 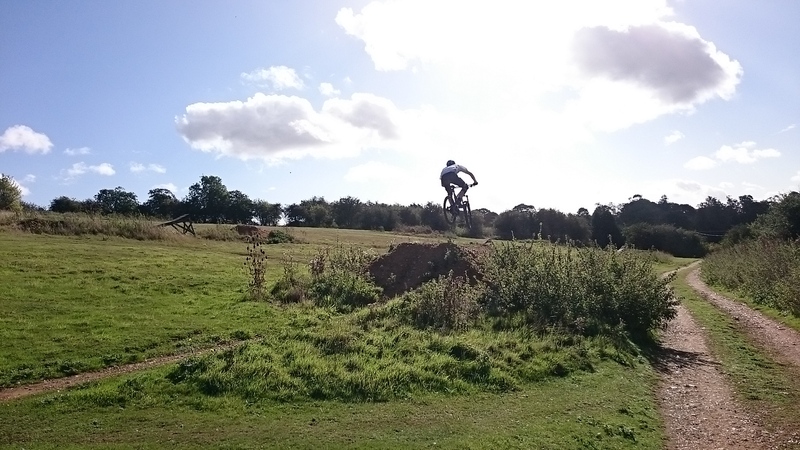 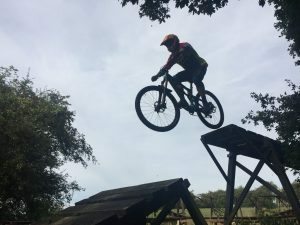 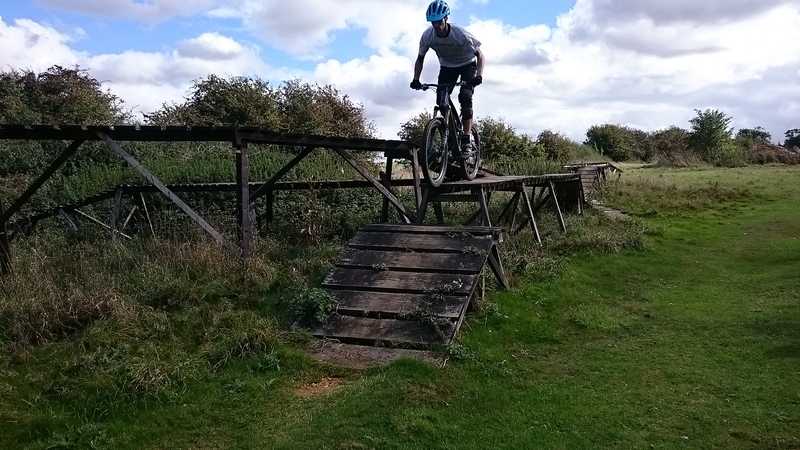 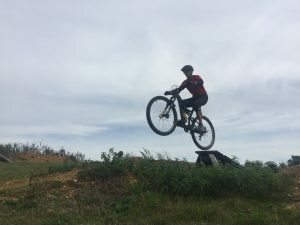 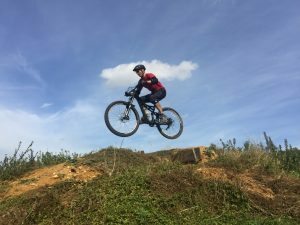 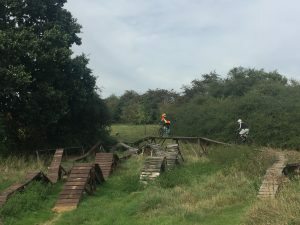 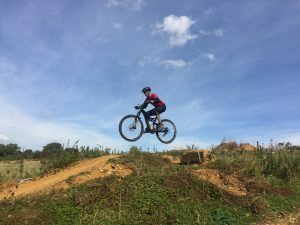 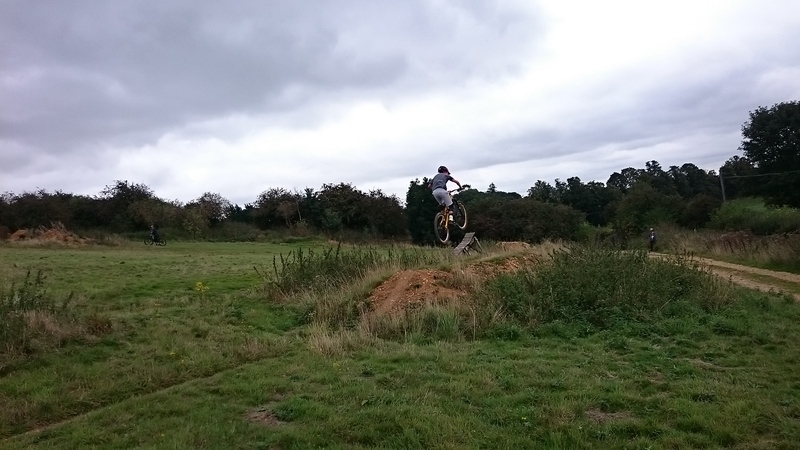 By the end of the session thye were linking large jumps together as well as riding 6ft, 7ft and 9ft gap jumps and even a wall ride. 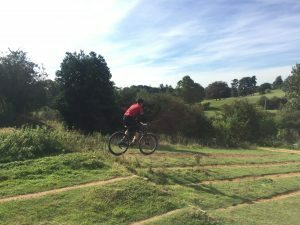 Mike and Lisa can ride! 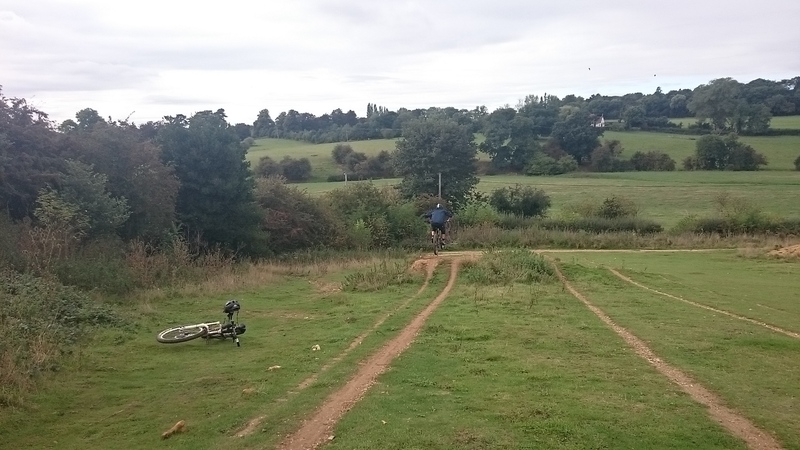 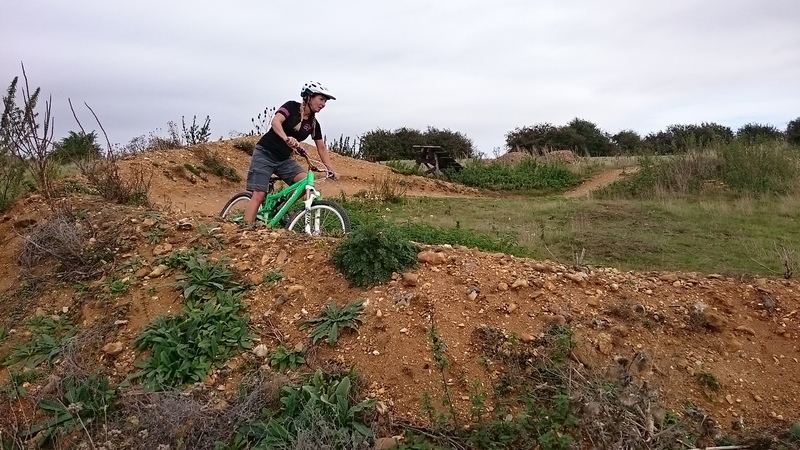 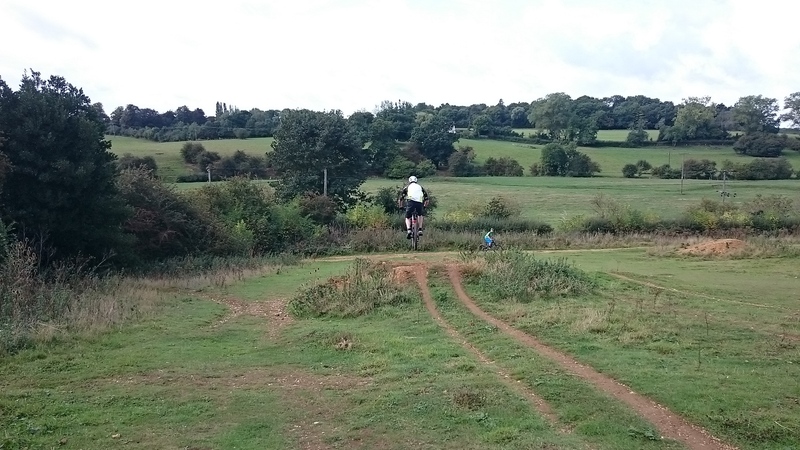 Mike and Lisa are partners and wanted to share mountain biking together as a pastime . 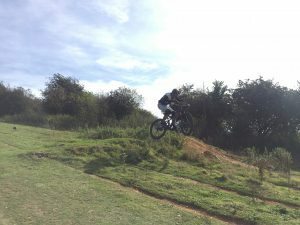 They were recommended to myself by Ben Carver whom I have coached before and today was the day they were meant to have. 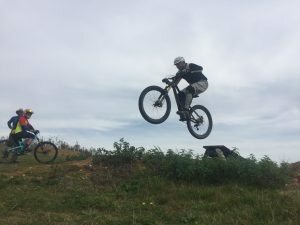 They never in their wildest dreams thought drops and jumps would feel so simple or that they would be able to do it, let alone gap jumps! 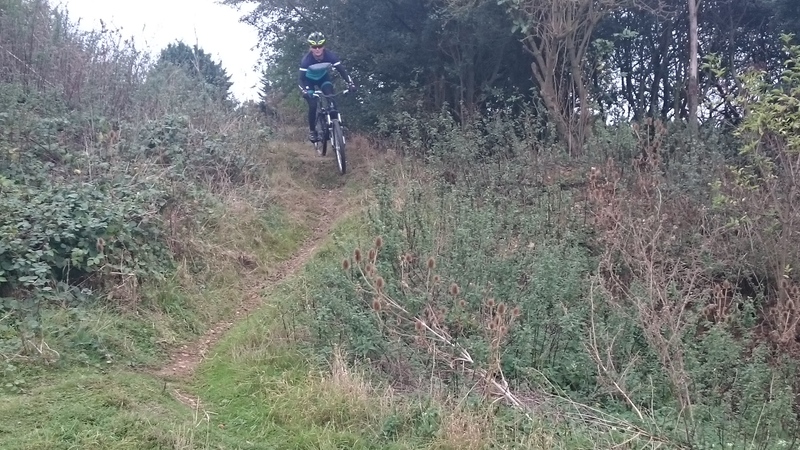 They rode berms and pumped the trails as they went and even rode a steep drop off a good few times too. 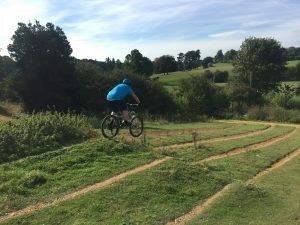 Richard and his wife Jasmine from openwaterswim.co.uk came up for some more mtb skills coaching and brought along , Jo, Simon, Paul and Hannah too. 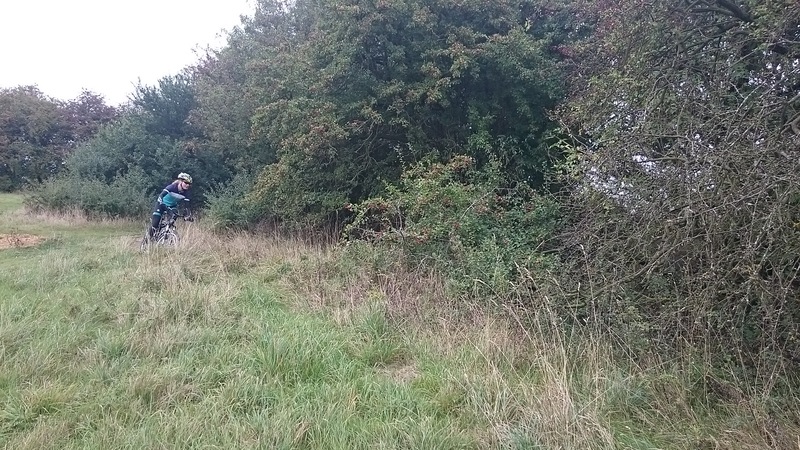 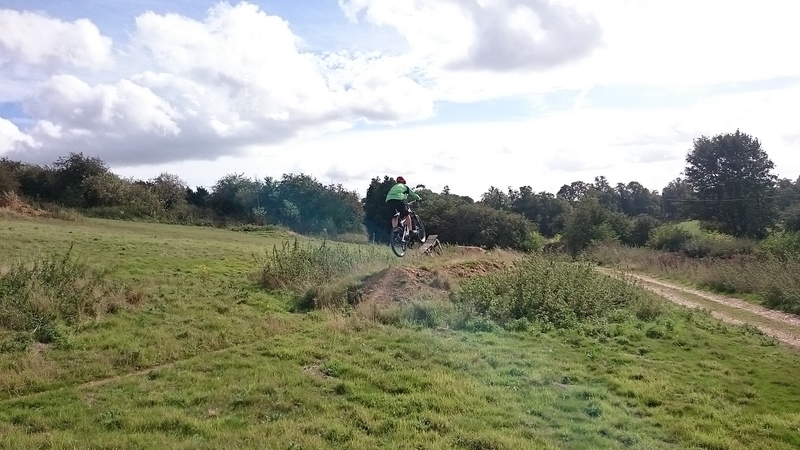 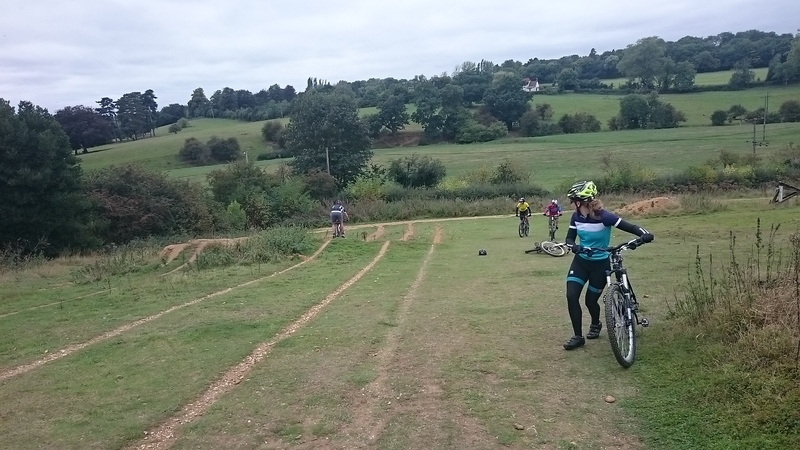 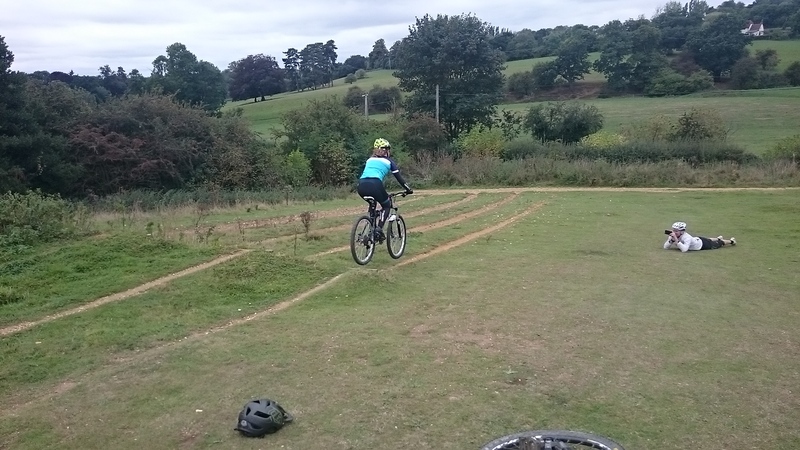 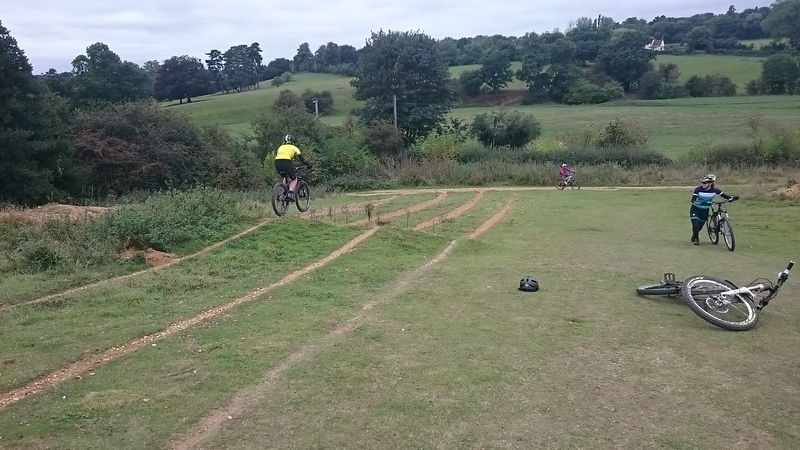 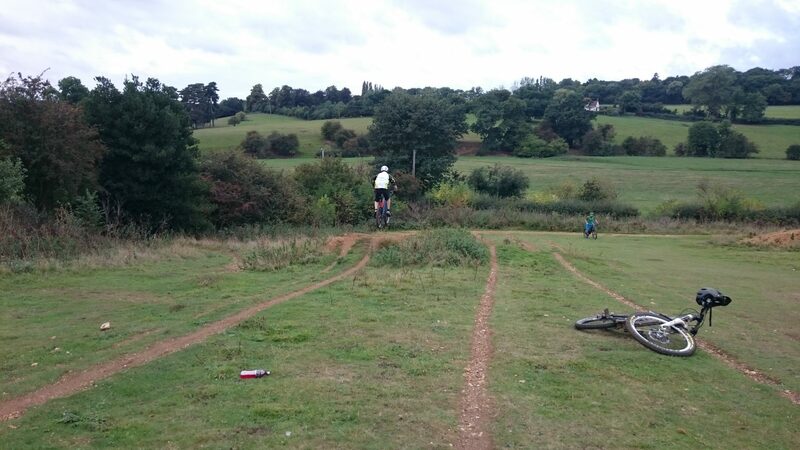 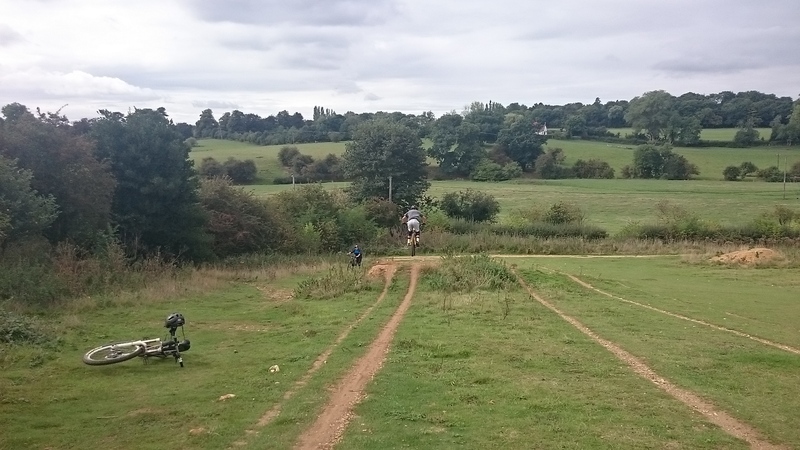 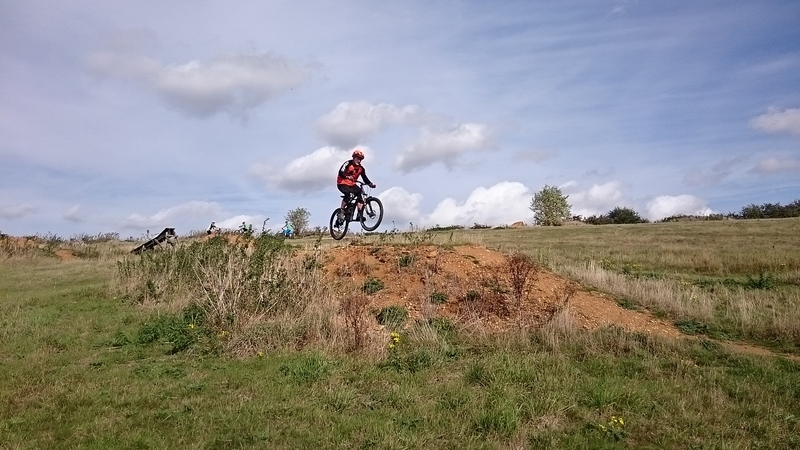 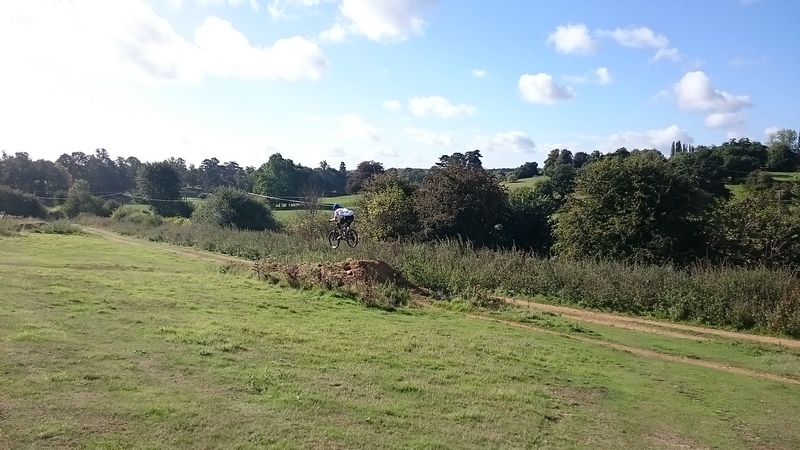 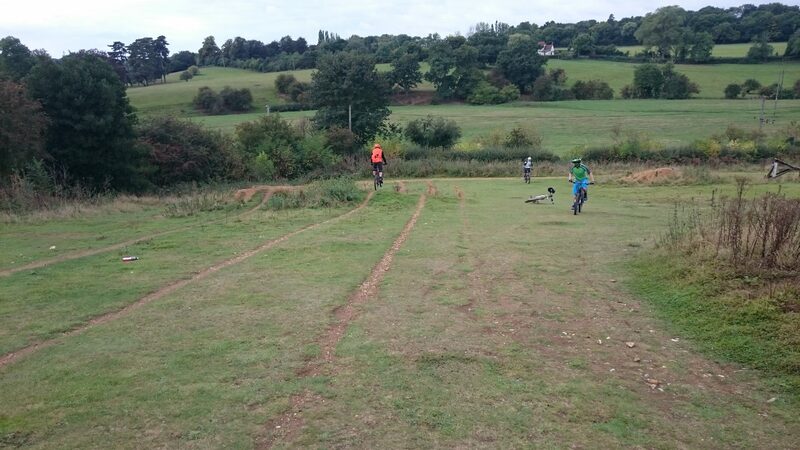 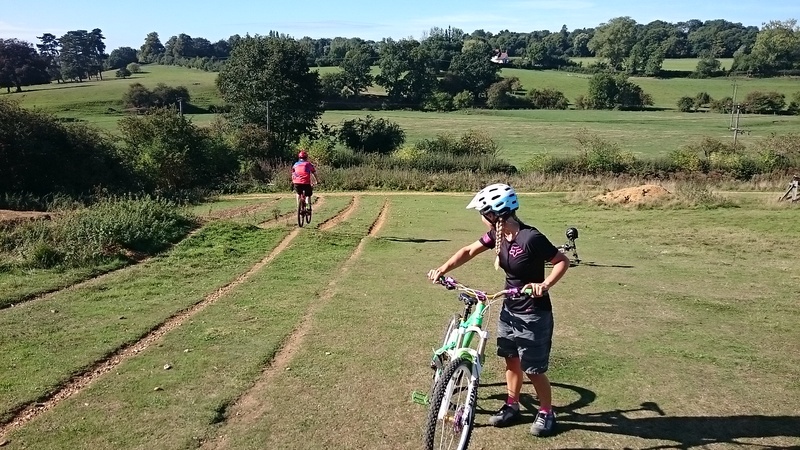 The session was based on gaining control and developing their riding skills when riding off road. 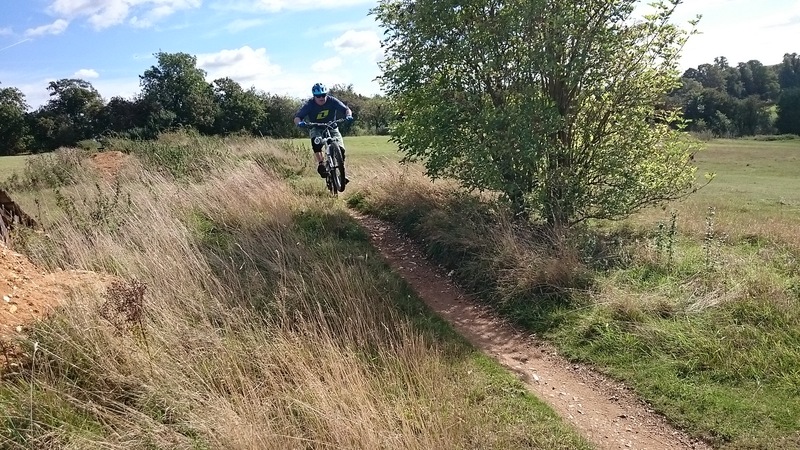 Getting air under their wheels first before working on cornering, pumping and absorbing sections of the trails to gain flow. 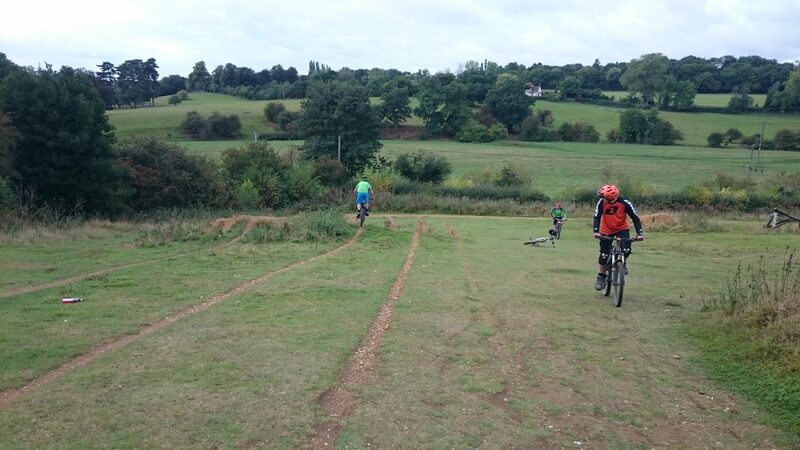 A brilliant session unfolded and everyone enjoyed it and gain loads. 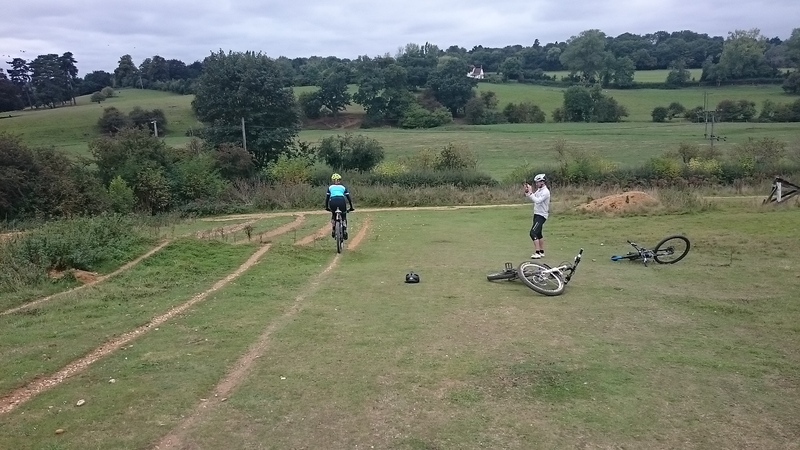 We ended the session as I always do with Richard, in the pub where we chatted of all things bikes! 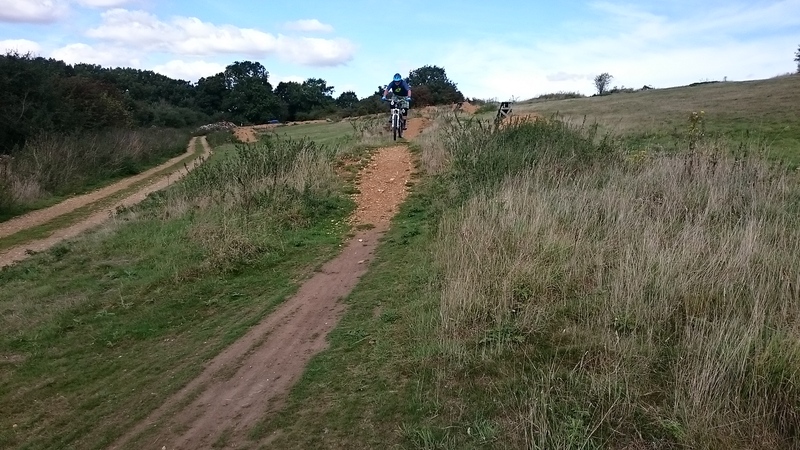 Brilliant day guys, really good progression from all! 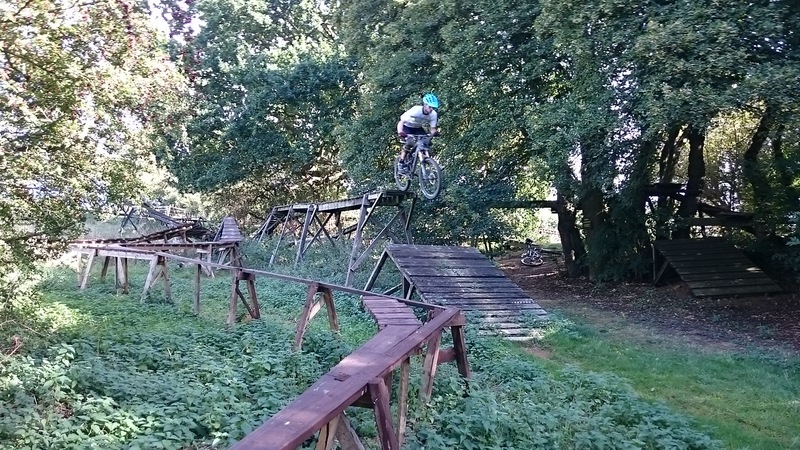 First, I must apologize for the loss of some pictures through upload mistaken delete. 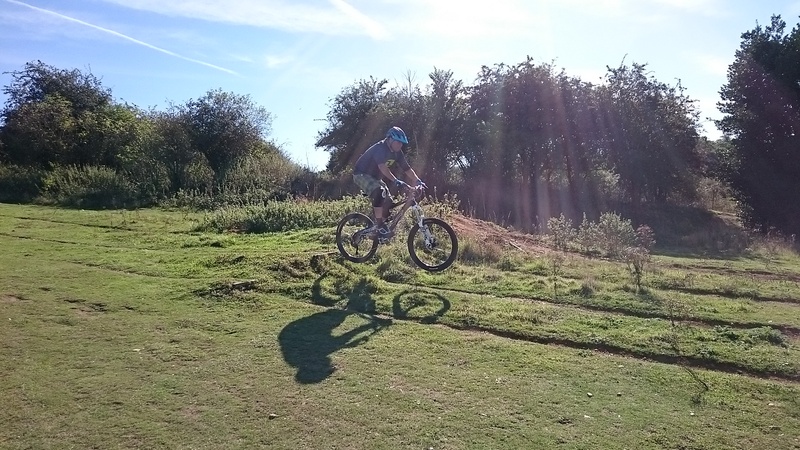 Bob wanted to gain more confidence in his riding and learn the secret to airtime. 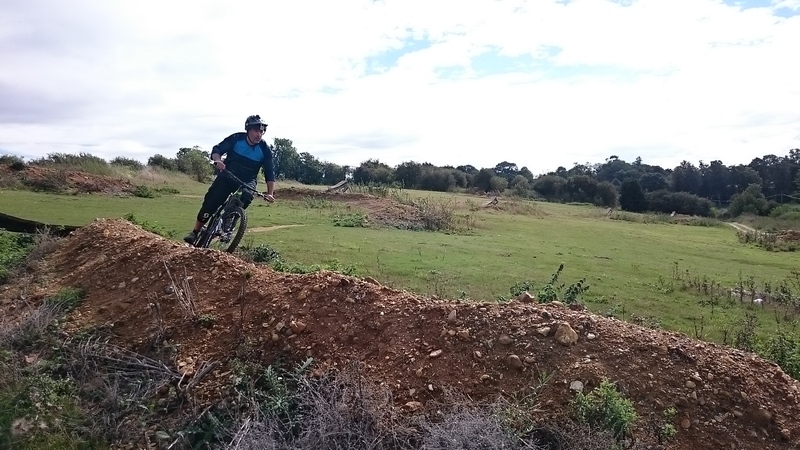 Today, we laid a foundation that he will build on forever more. 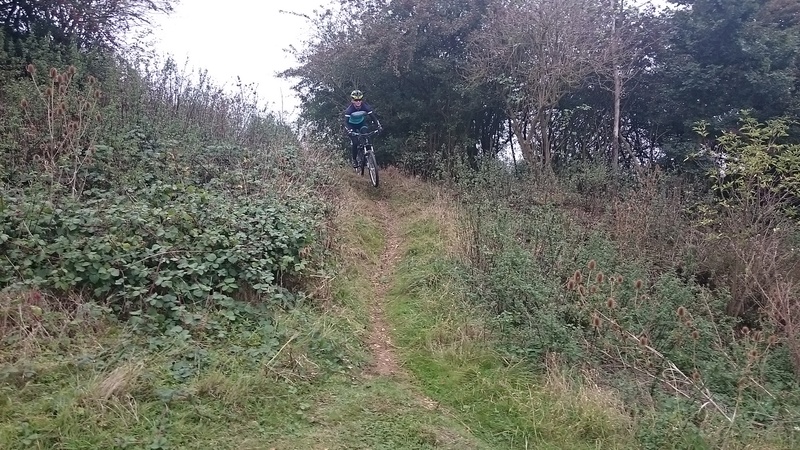 The skills check show myself and importantly, themselves where things were going wrong and I set about correcting it. 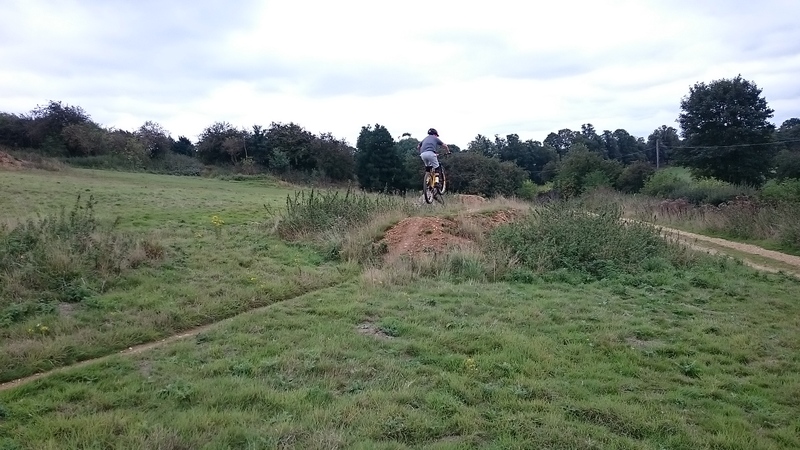 They Wanted to get comfortable in the air and boy oh boy did they. 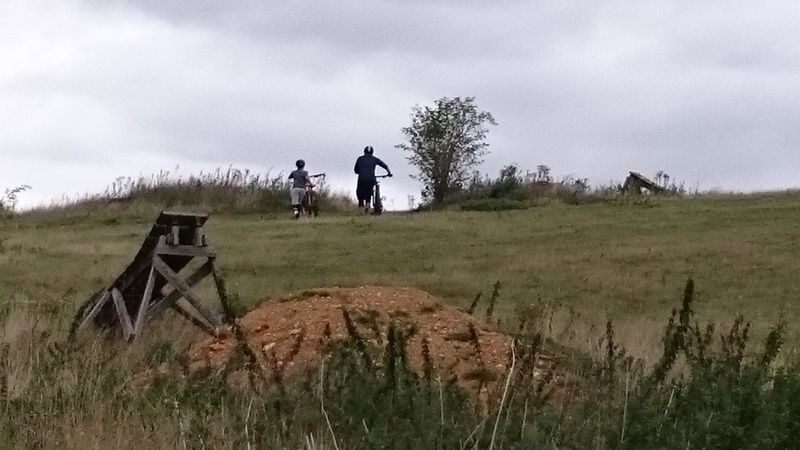 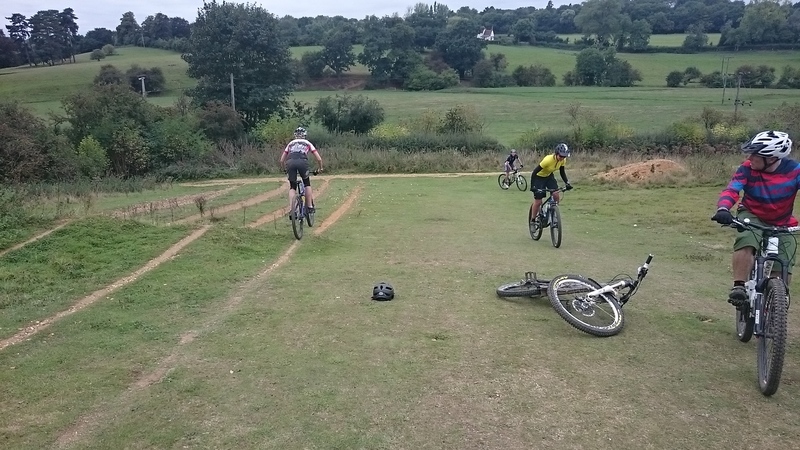 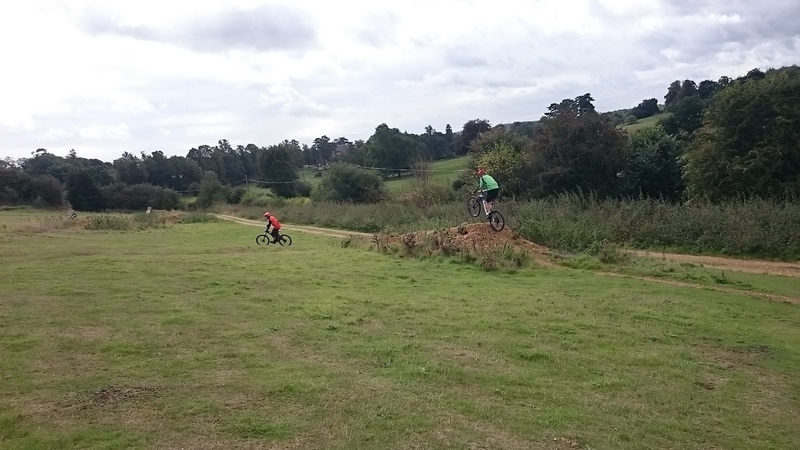 A fantastic session unfolded and they ended by linking gap jumps and berms together and smiling from ear to ear.